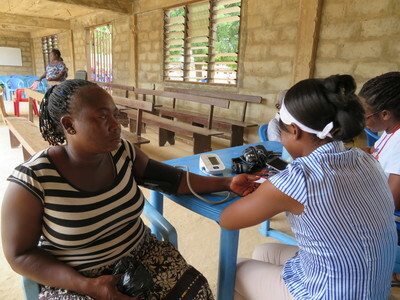 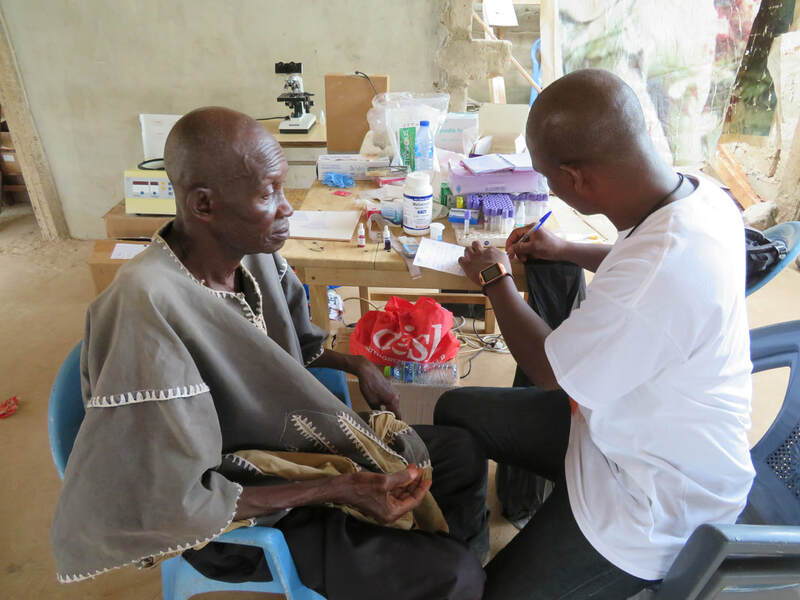 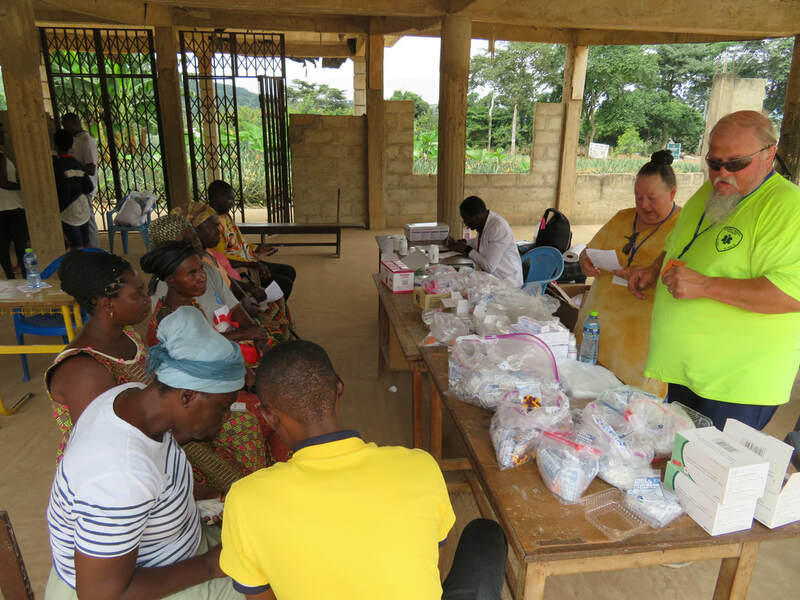 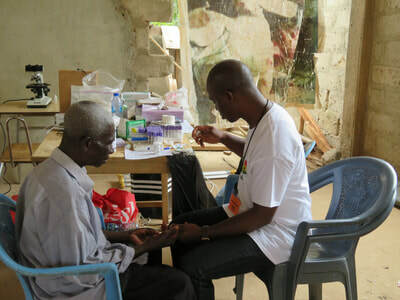 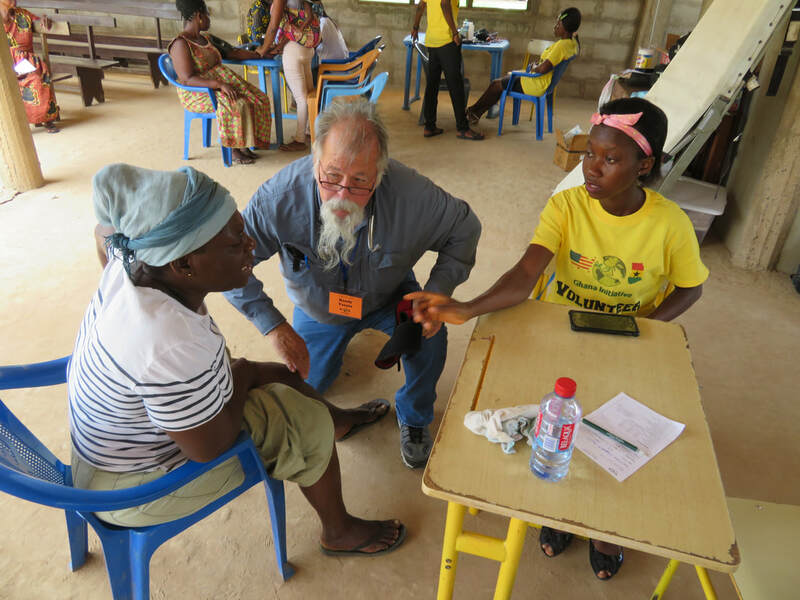 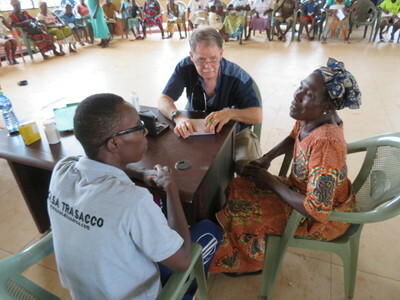 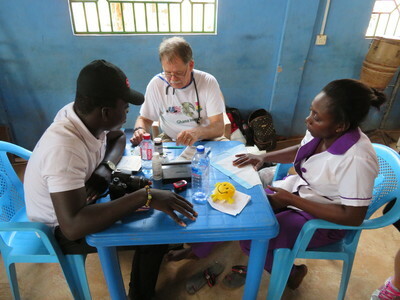 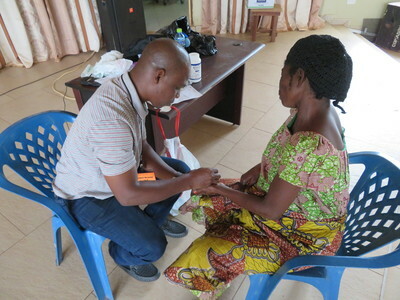 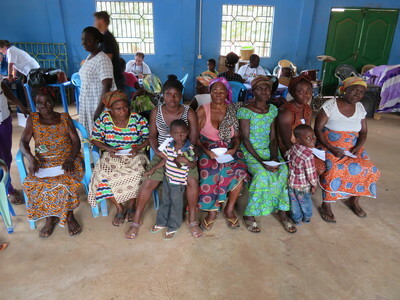 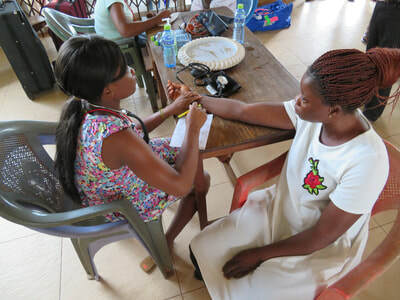 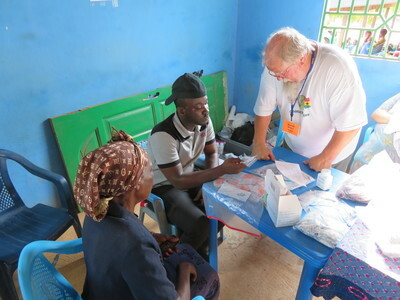 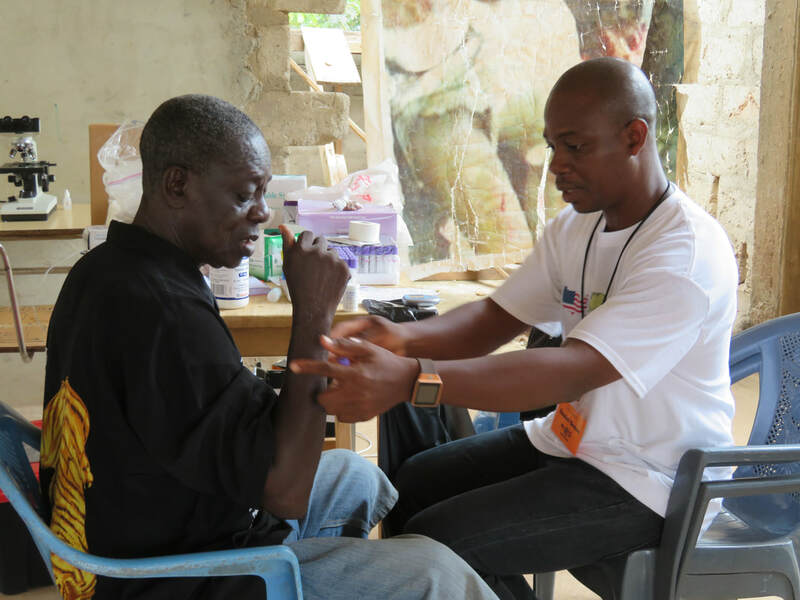 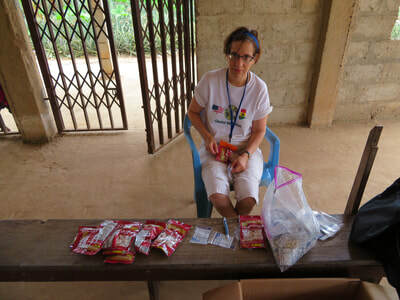 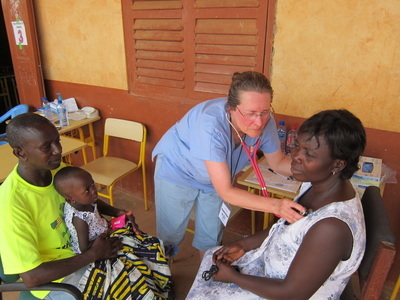 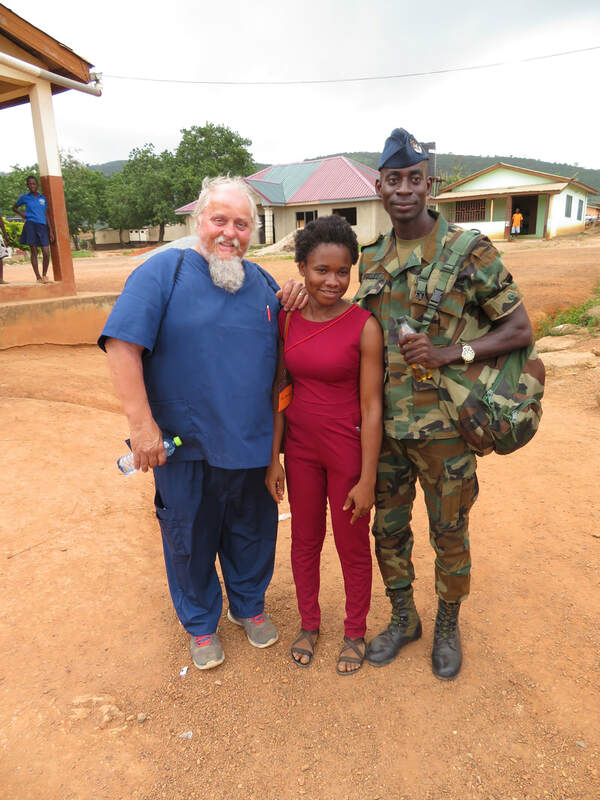 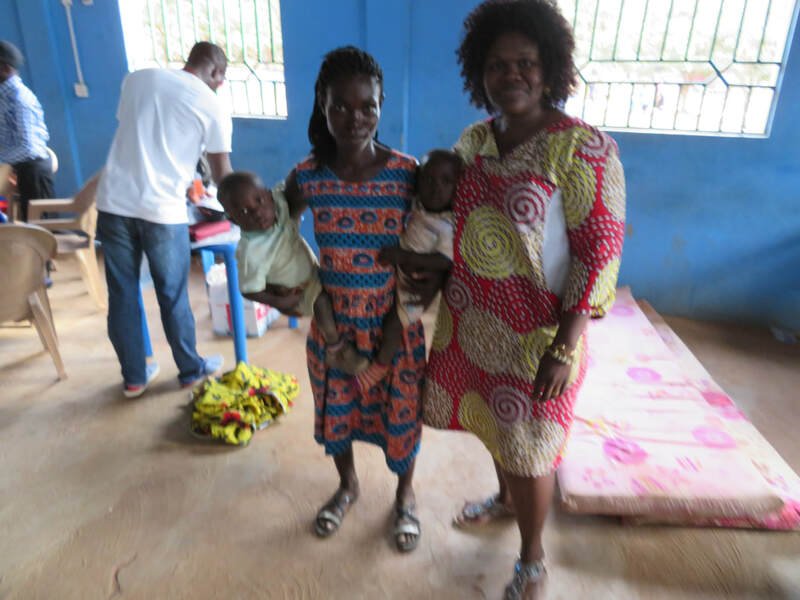 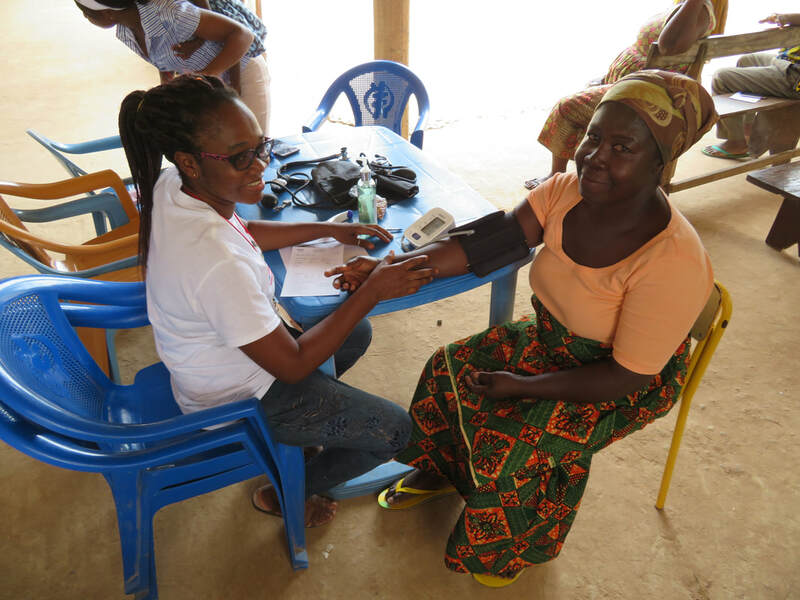 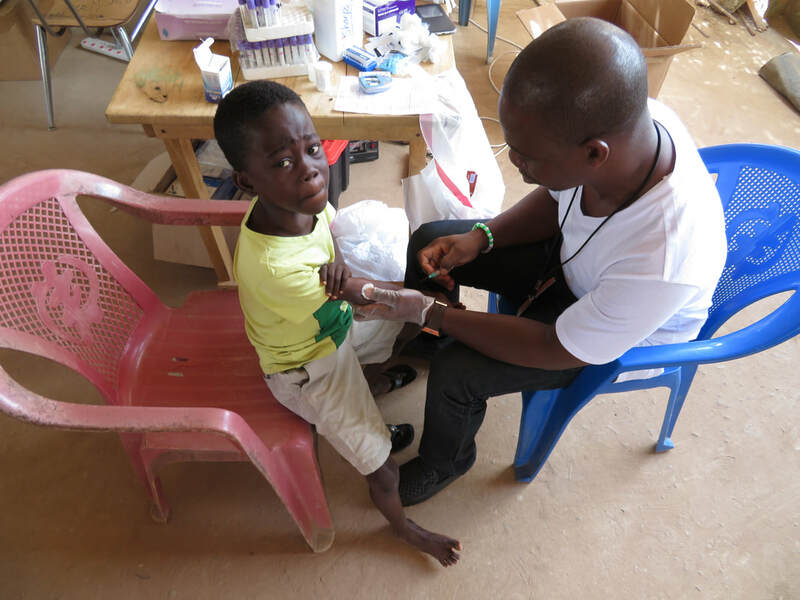 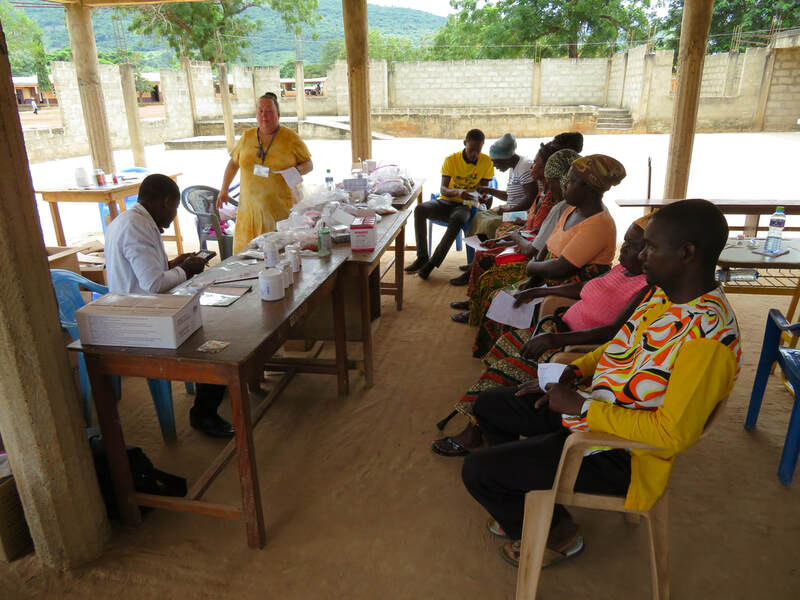 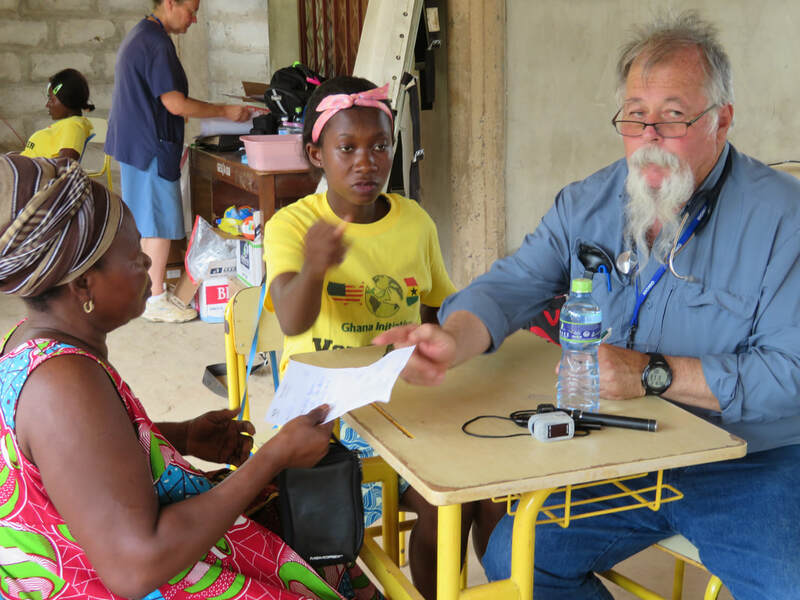 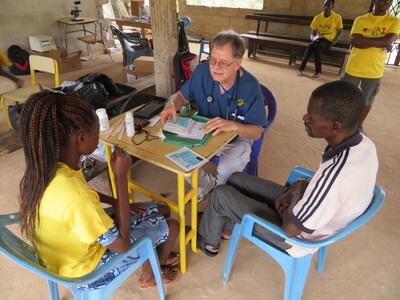 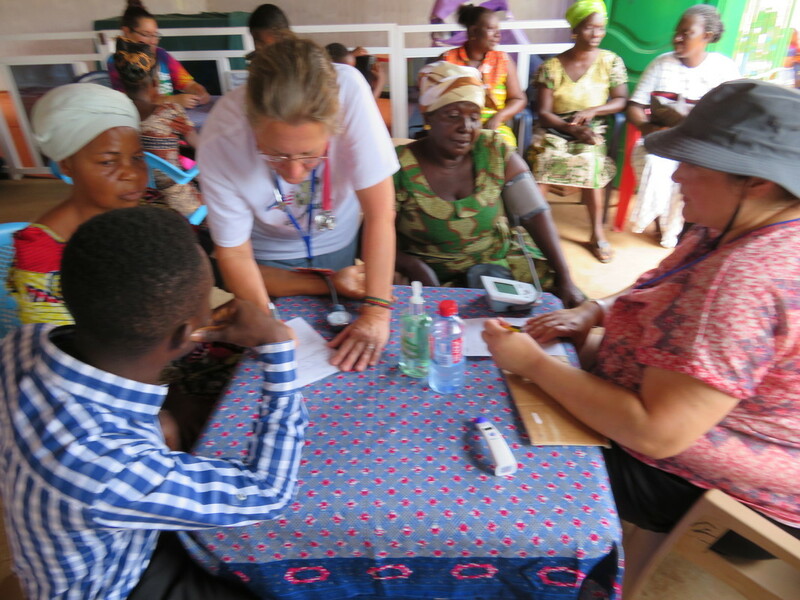 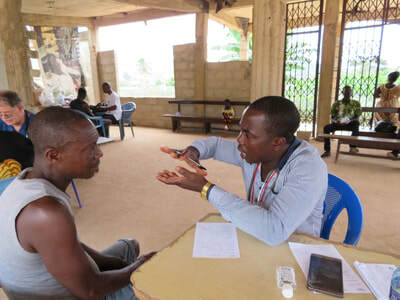 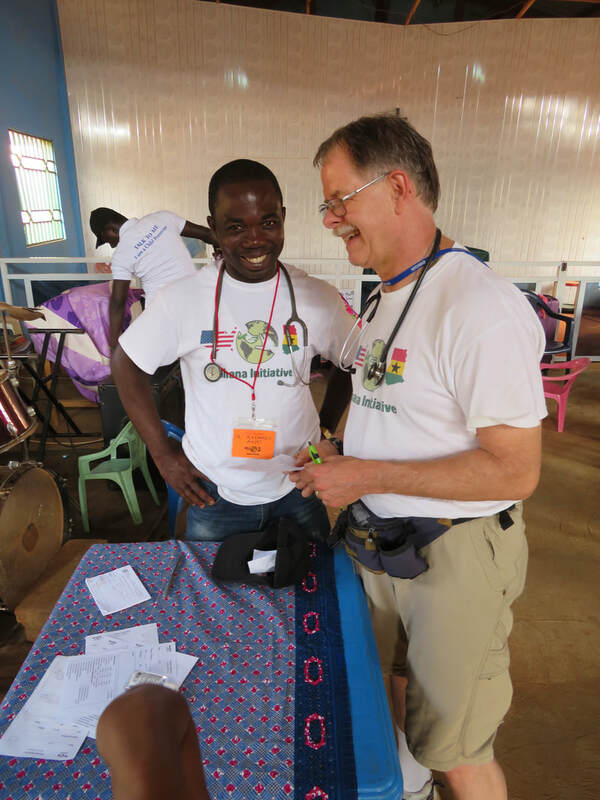 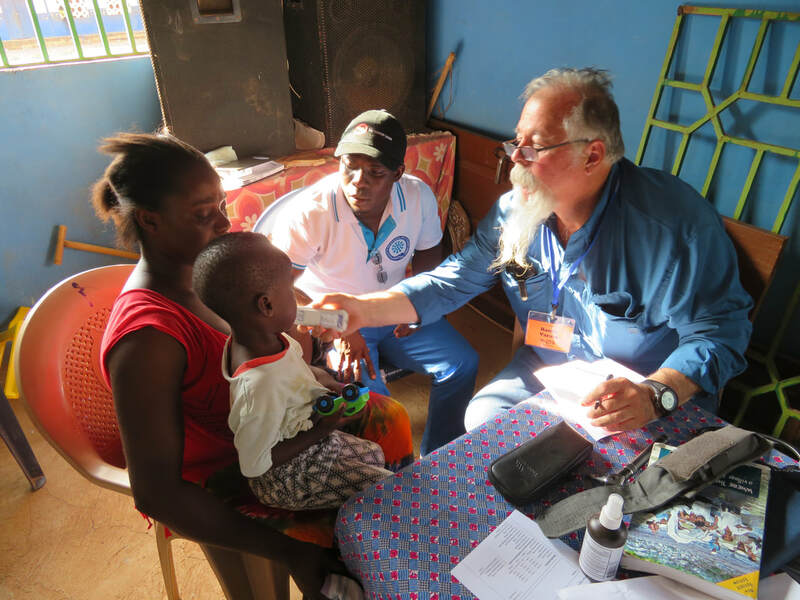 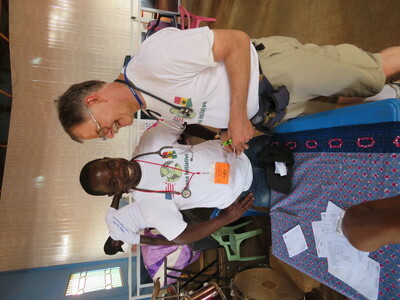 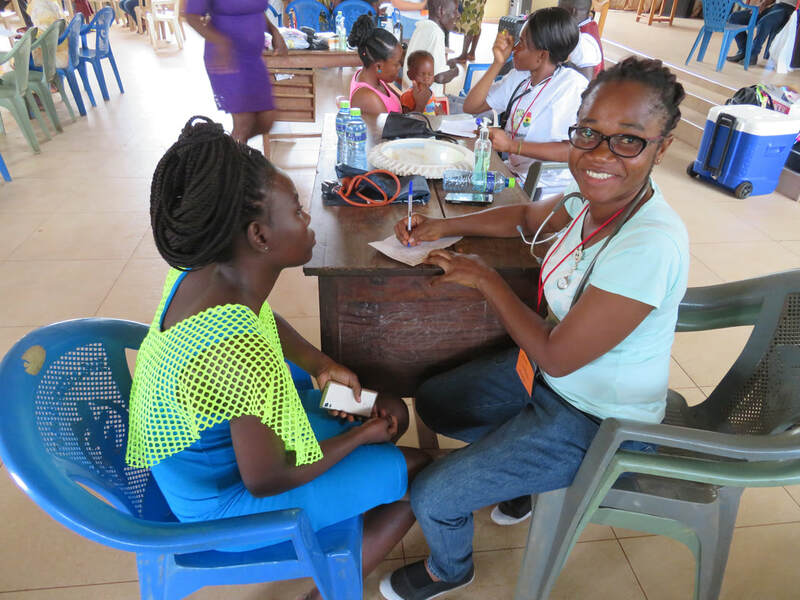 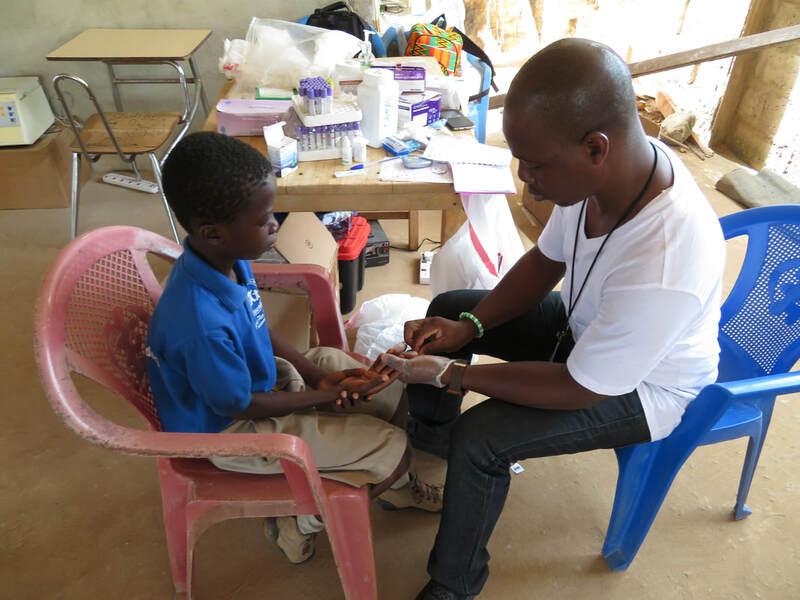 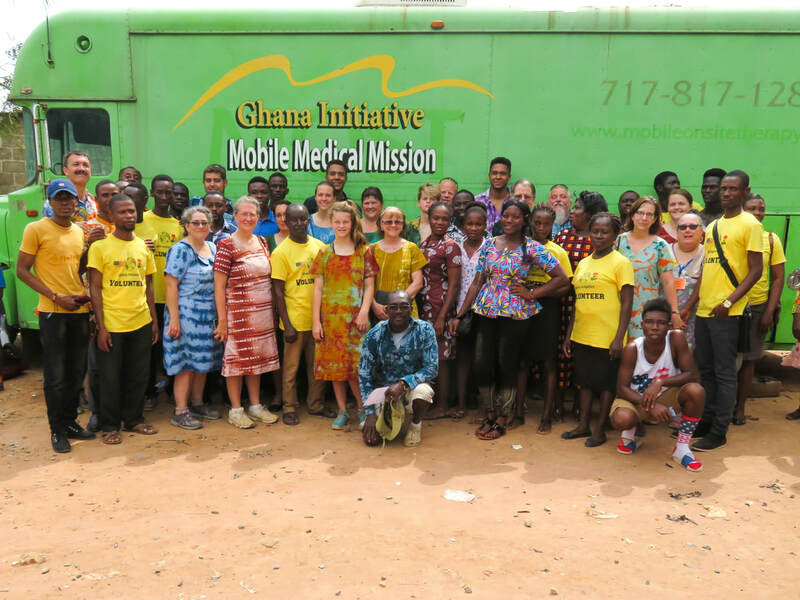 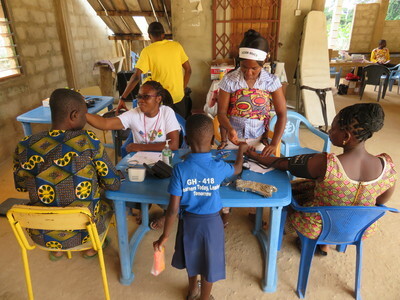 Each summer, Ghana Initiative MMM sends teams travel to the Eastern Region of Ghana to serve those in need of medical care. Teams of 15 to 20 members work together to meet the physical needs of more than 1000 men, women and children as many as three rural communities. We provide our services free of charge, asking only that our patients spread the word about Ghana Initiative MMM to friends and family in need. 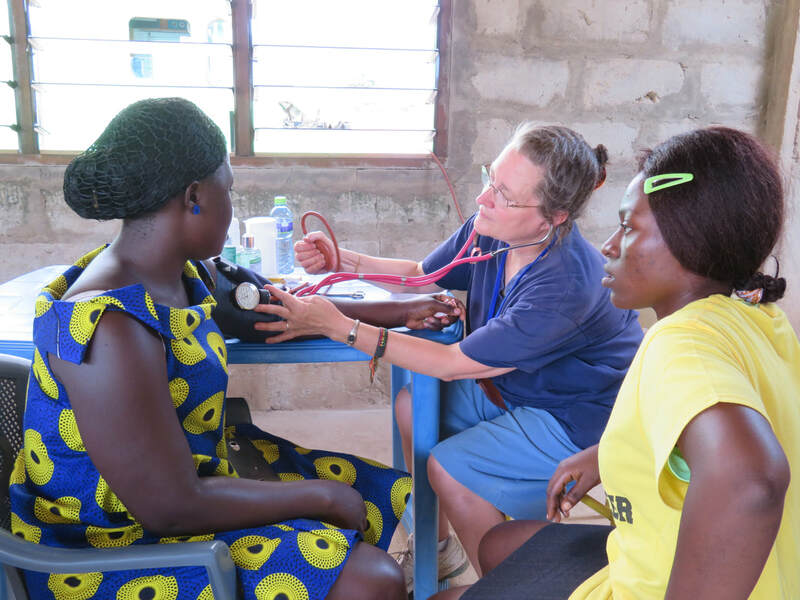 Our licensed doctors and nurses from the USA and Ghana work together to meet the various needs of those who visit our clinic. 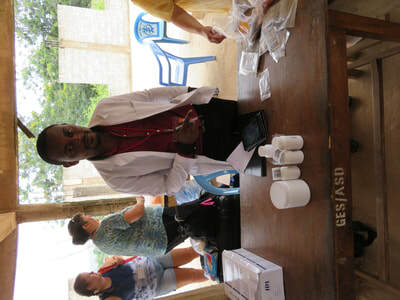 For patients who do not speak English, we provide translators. 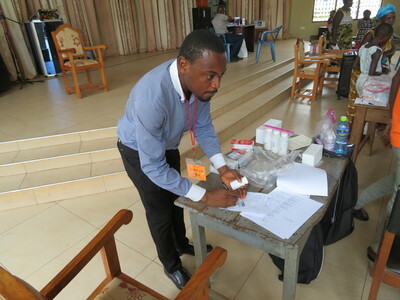 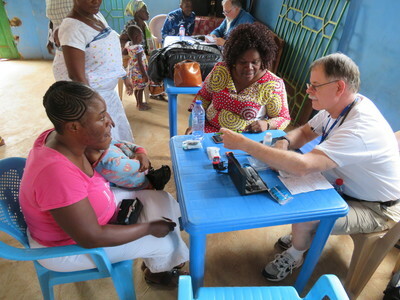 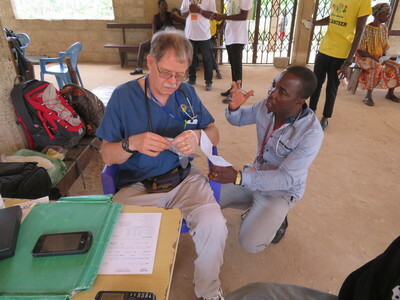 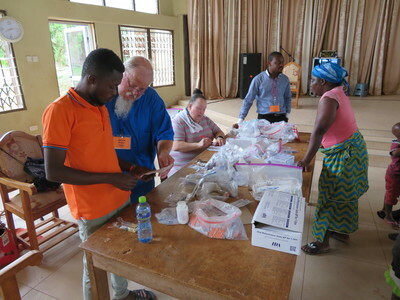 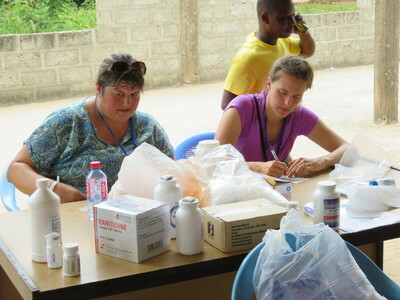 The Ghana Initiative MMM pharmacy is operated by pharmacy professionals from the USA and Ghana. 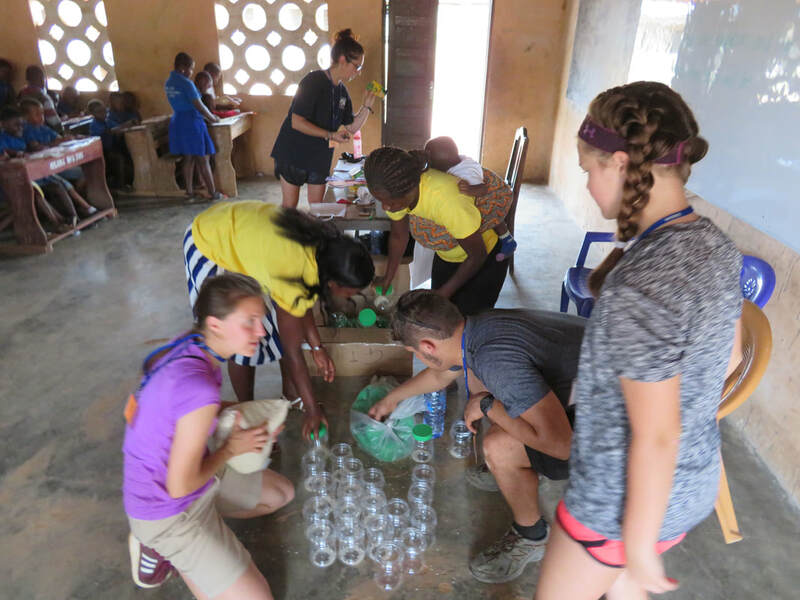 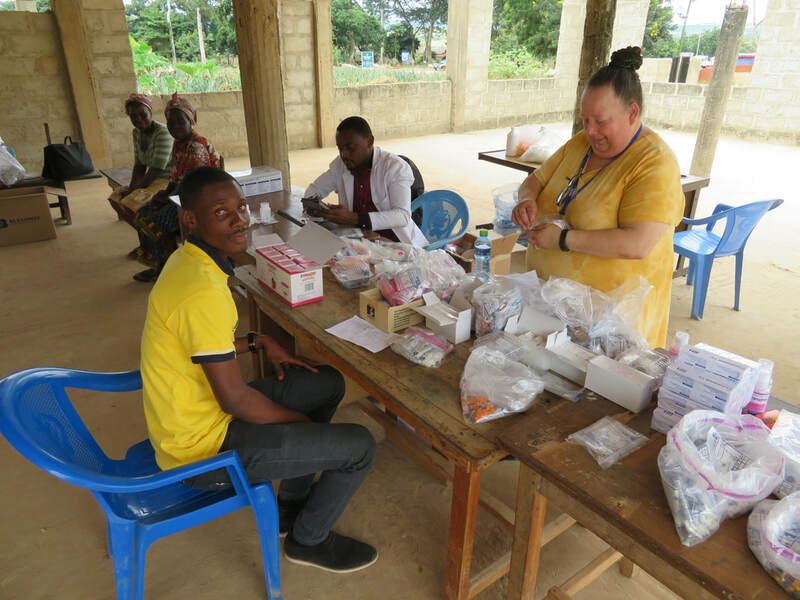 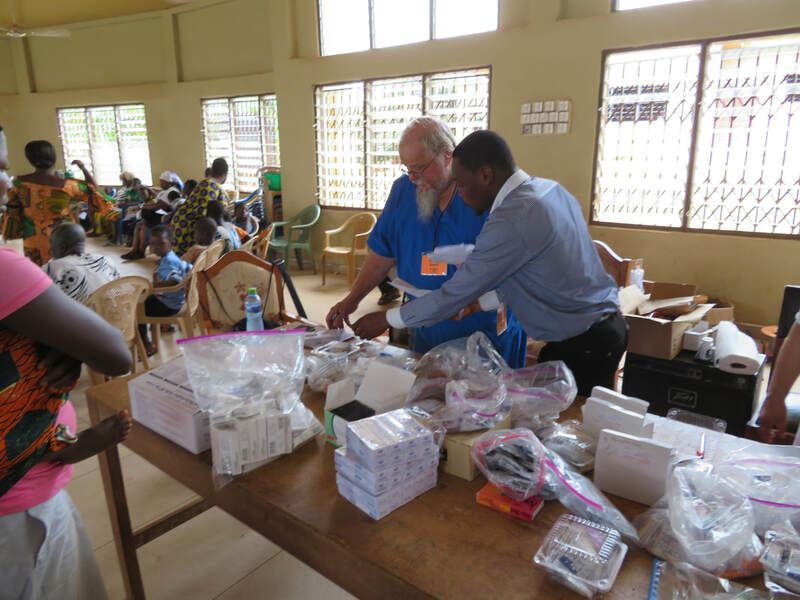 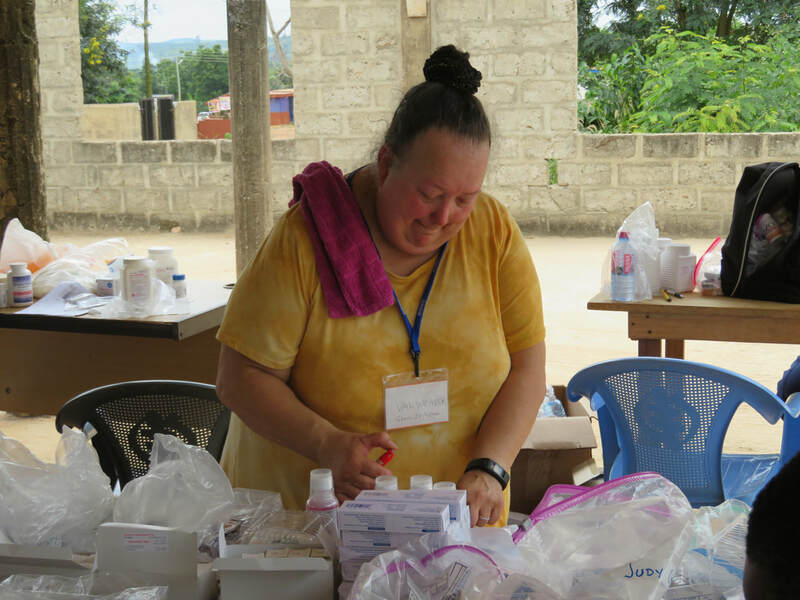 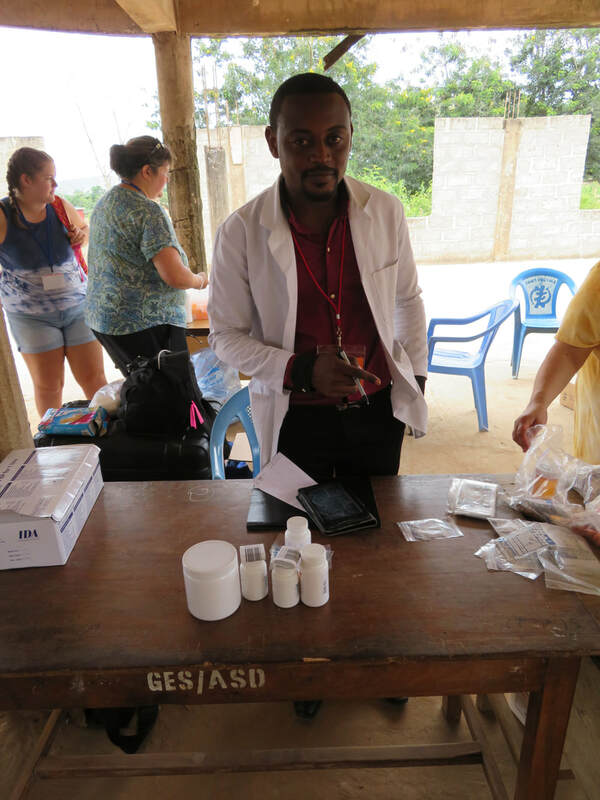 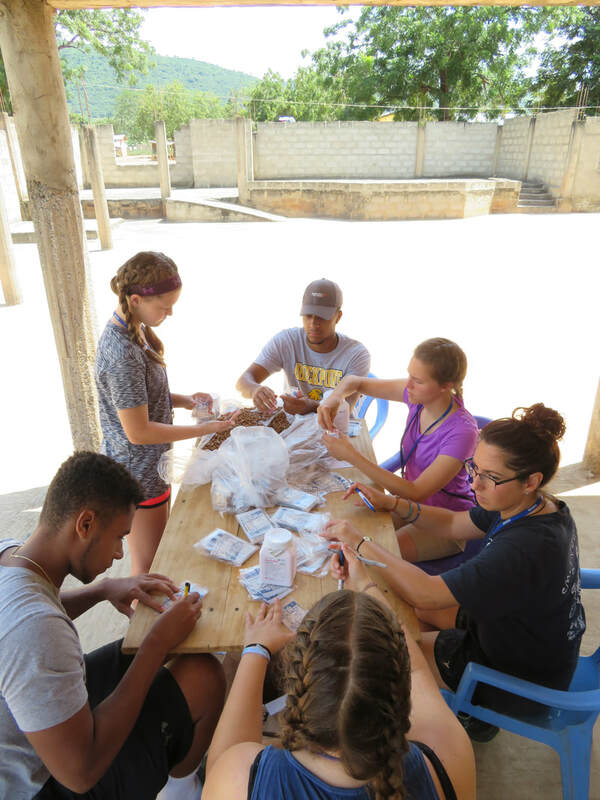 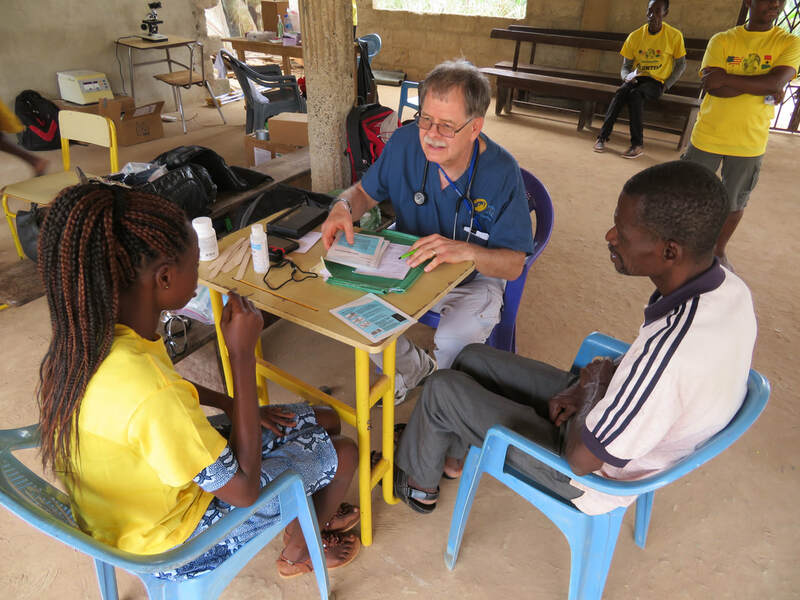 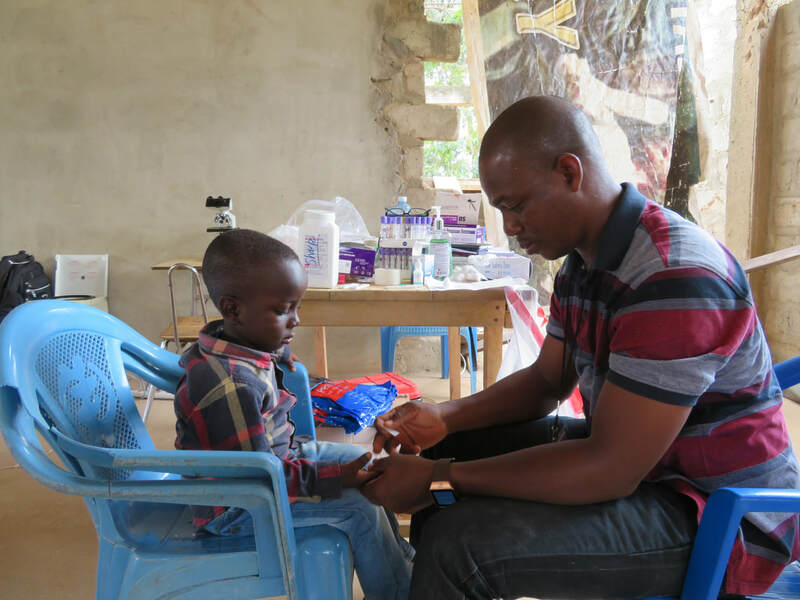 The pharmacists and pharmacy technicians work hand in hand to dispense medications procured through Blessings International. Our medications are as varied as the medical needs of our patients. 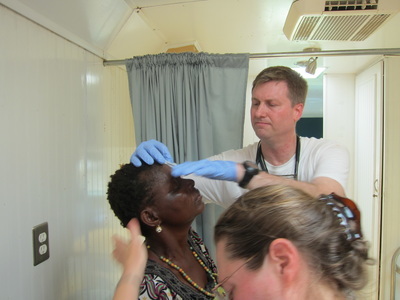 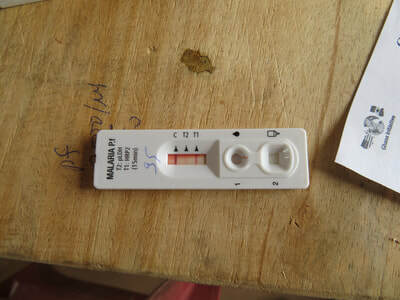 We treat anything from the Common Cold to Malaria and Yellow Fever. 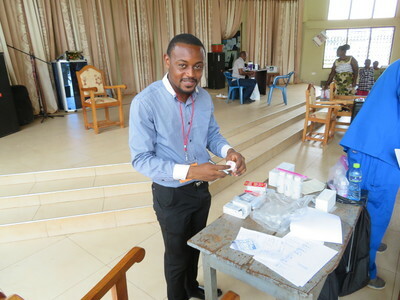 As the medical ministry of Ghana Initiative MMM has grown over the last few years, we have developed the ability to offer diagnostic testing through the efforts of our biological scientist, Daniel Senoo. 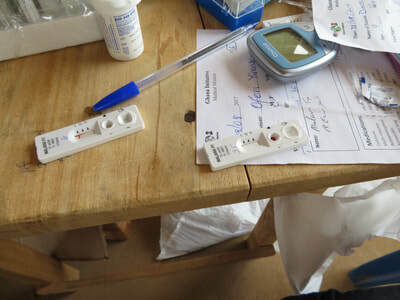 We are now able to diagnose and treat diseases and medical issues that would otherwise have only been possible at hospitals in the capital city of Accra. 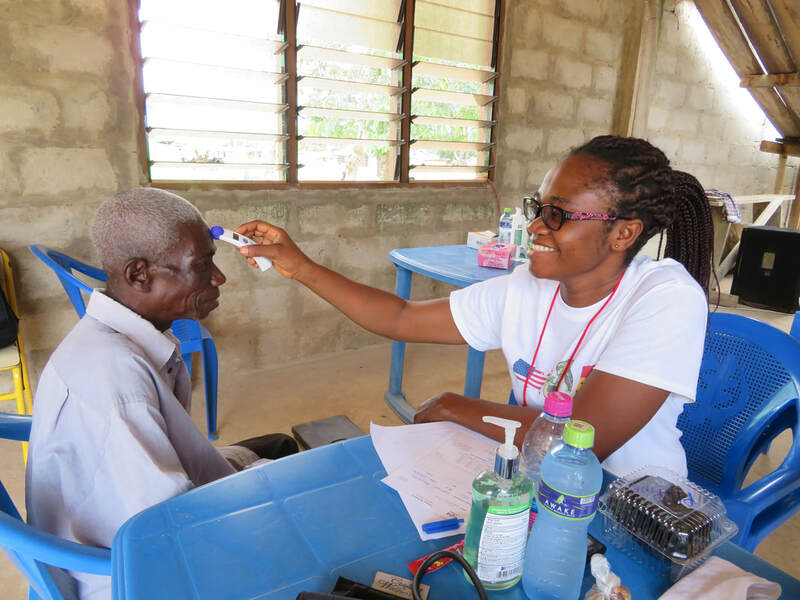 Our patients are now able to receive appropriate diagnoses and treatment without arduous trips to distant hospitals that are already overburdened. Bible School is filled with joy and excitement. 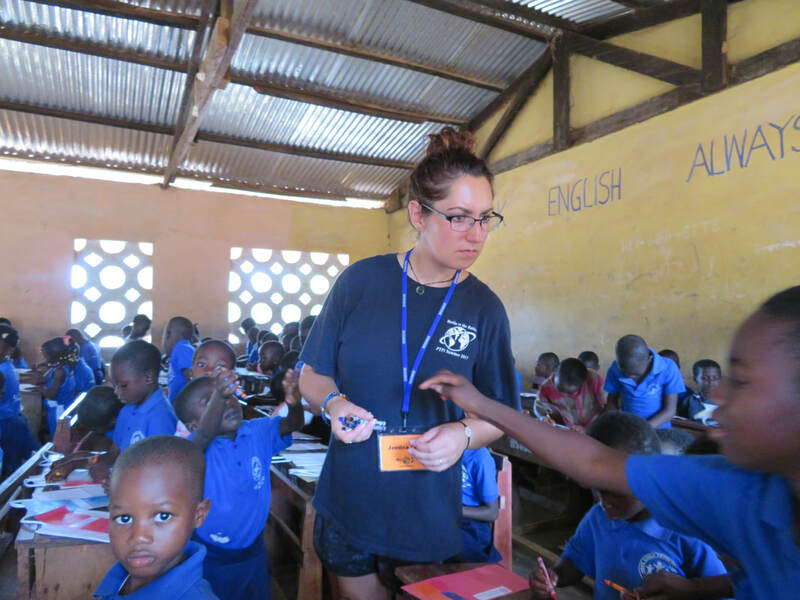 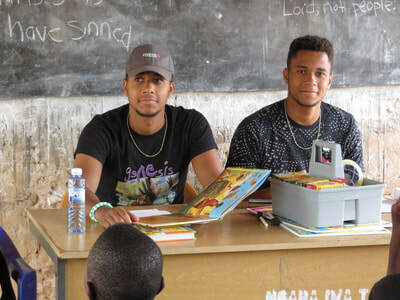 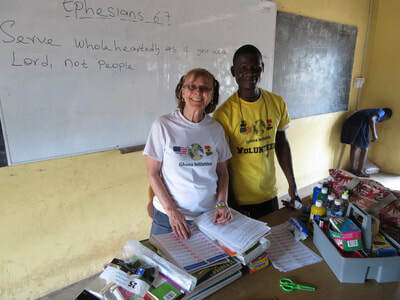 Teachers and translators present Bible lessons to more than 400 children aged 5-16 in four classrooms at local schools. 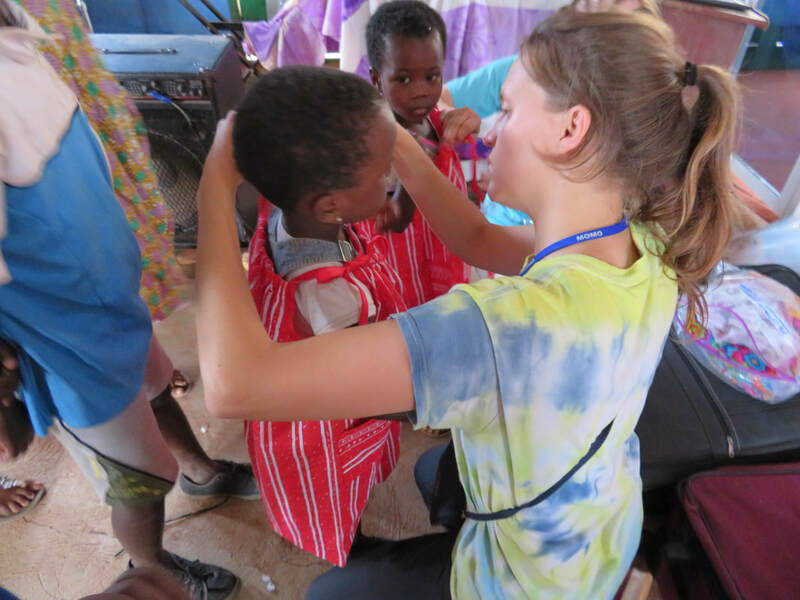 The children learn Bible stories through song, fun filled object lessons, special arts and crafts and theatrical presentations. Our teachers share the love of Christ as they plant seeds of biblical truth and salvation in the hearts of these precious children. 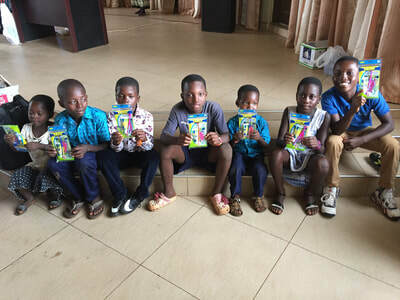 Bible school brings smiles to faces, fills hearts with joy and encourages the children to share the gift of salvation with family and friends. In Ghana, Football (soccer) is the national sport. 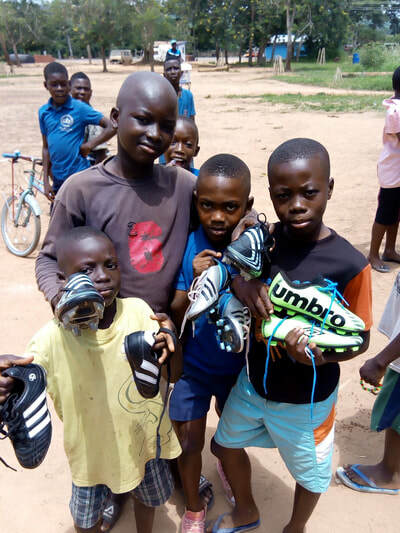 Children of all ages, both boys and girls play football. 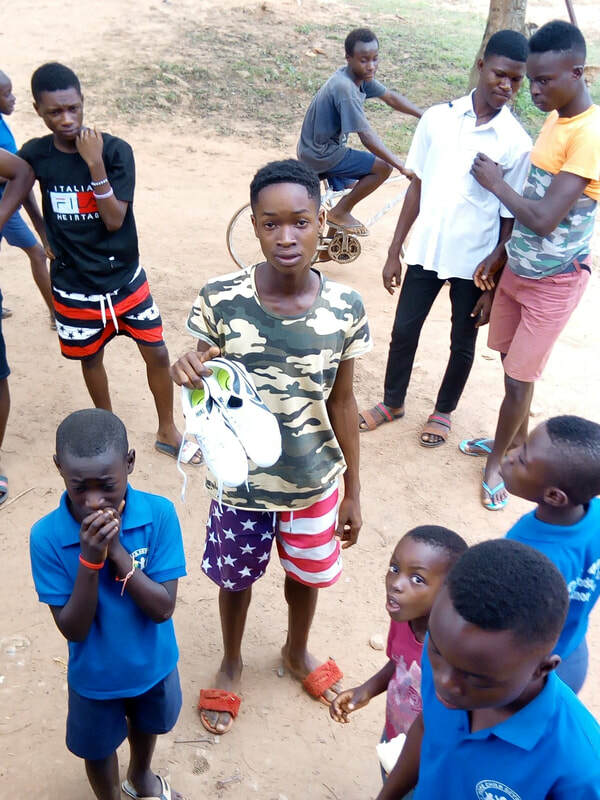 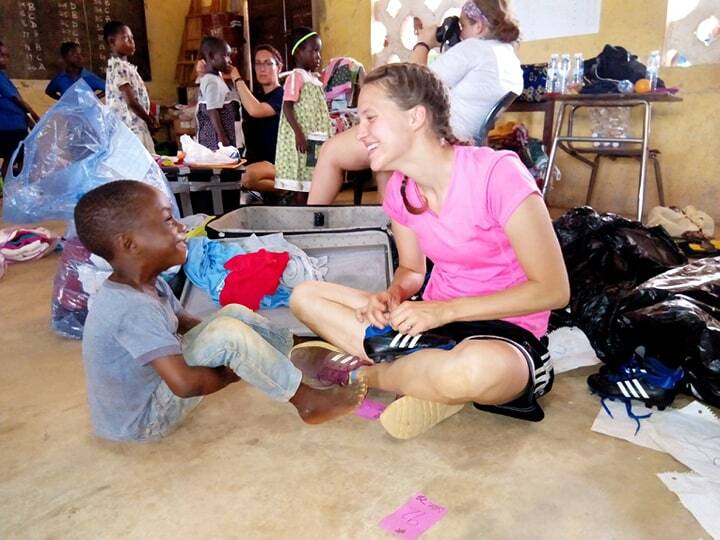 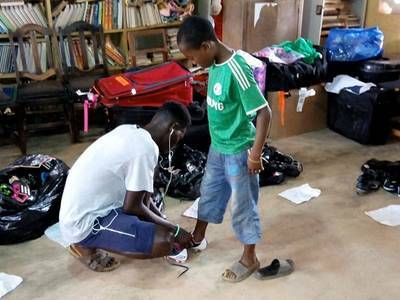 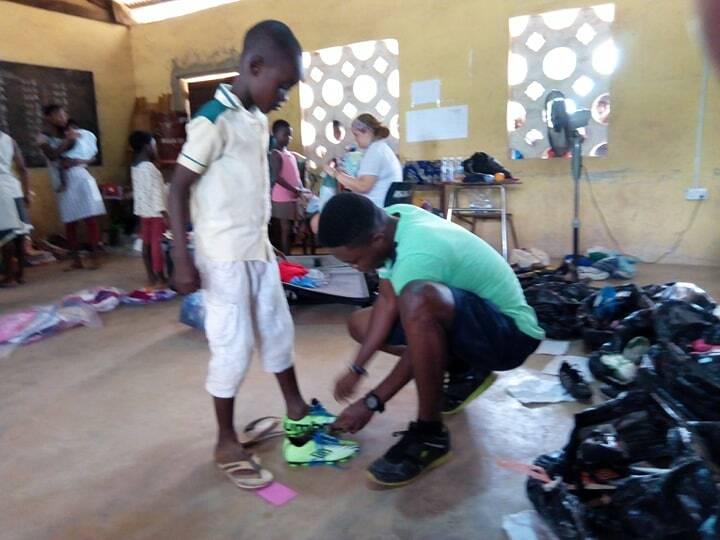 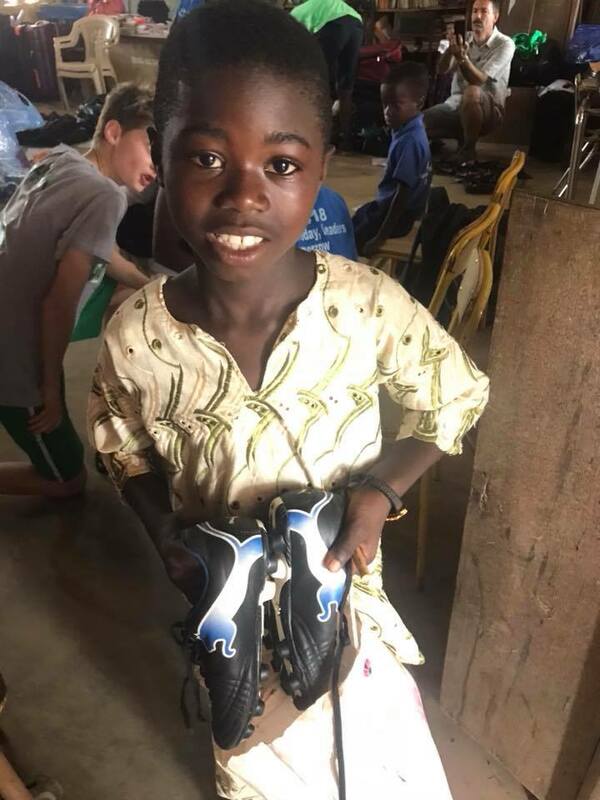 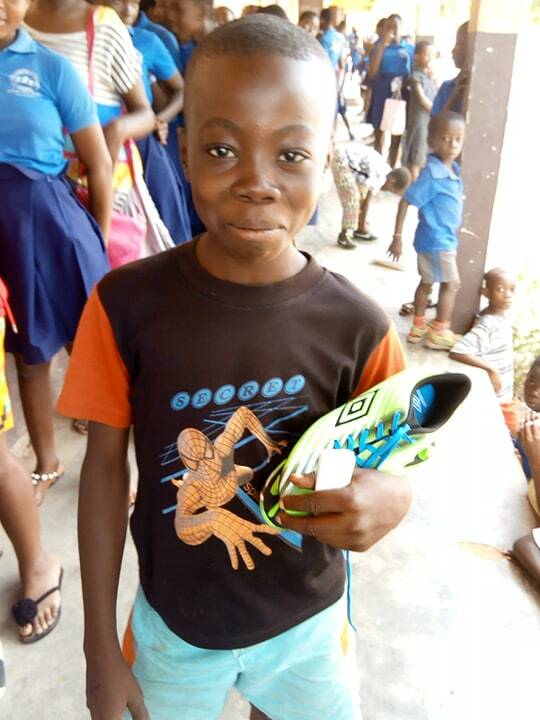 As a way of blessing children in the communities where we serve, our team members distribute free, new and gently used soccer cleats following a week at Bible school. 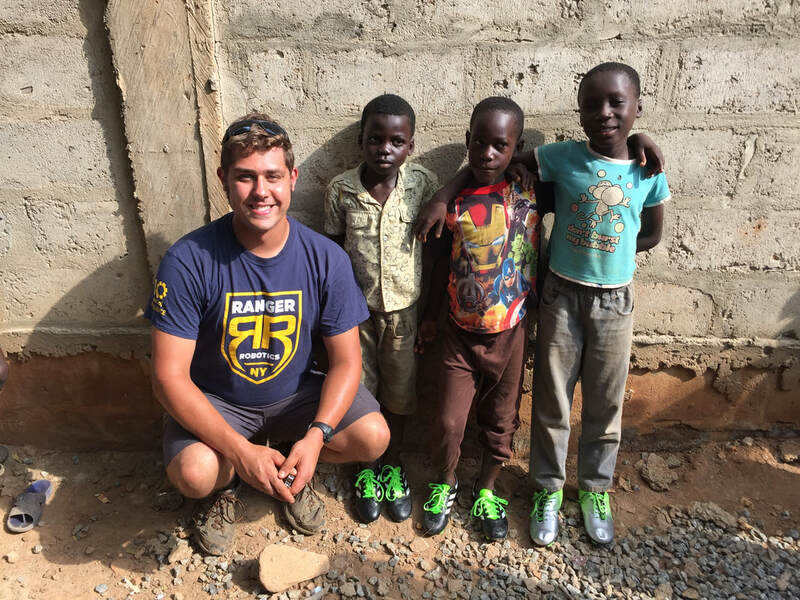 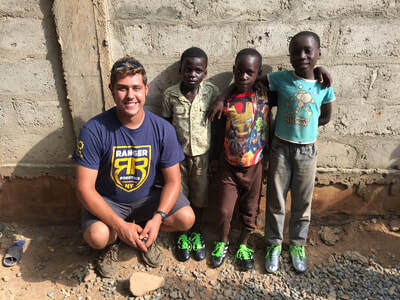 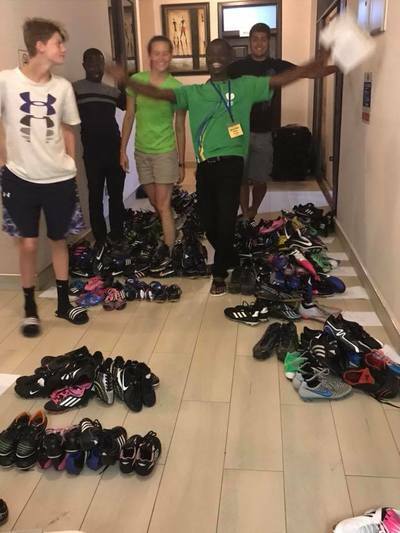 The cleats have been collected by the team members from family, friends and local businesses throughout the year and are shipped to Ghana ahead of the team with other mission supplies. 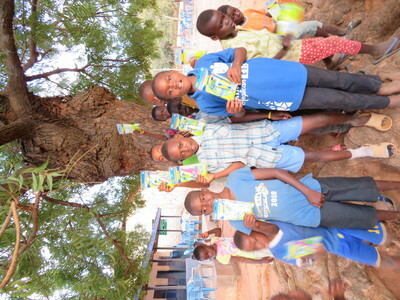 Each year this program grows. 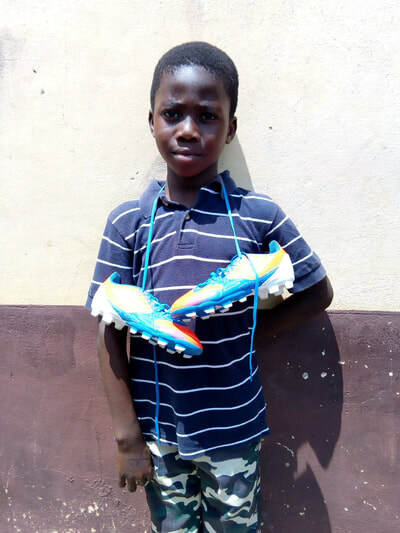 In 2018 our team distributed more than 600 pair of cleats in three rural communities. 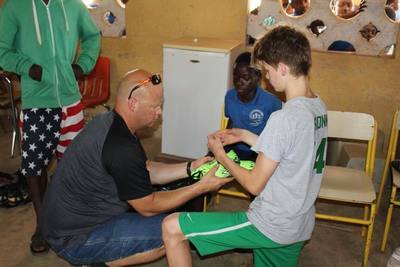 In one community we combined the cleat distribution with a community clean-up project. 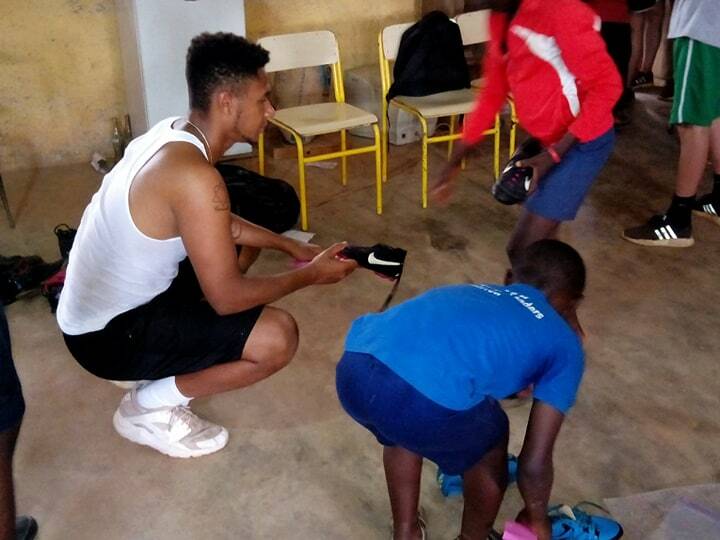 In order to receive a pair of cleats, each child aged 3-18 was challenged to collect at least ten pieces of trash from around the schools and center of town and bring the trash to the cleat distribution location. As they disposed of the trash, they were given a ticket for a free pair of cleats. 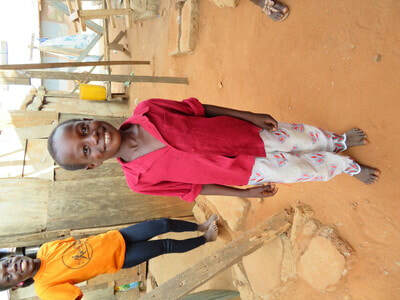 Who doesn't like to see a bright smile? 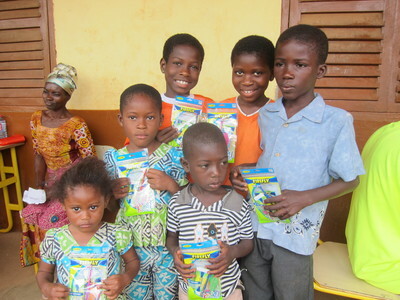 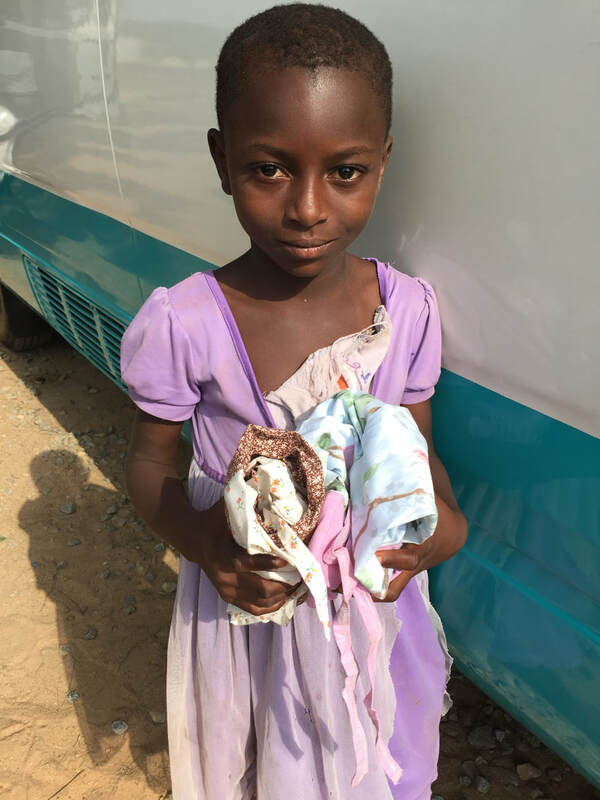 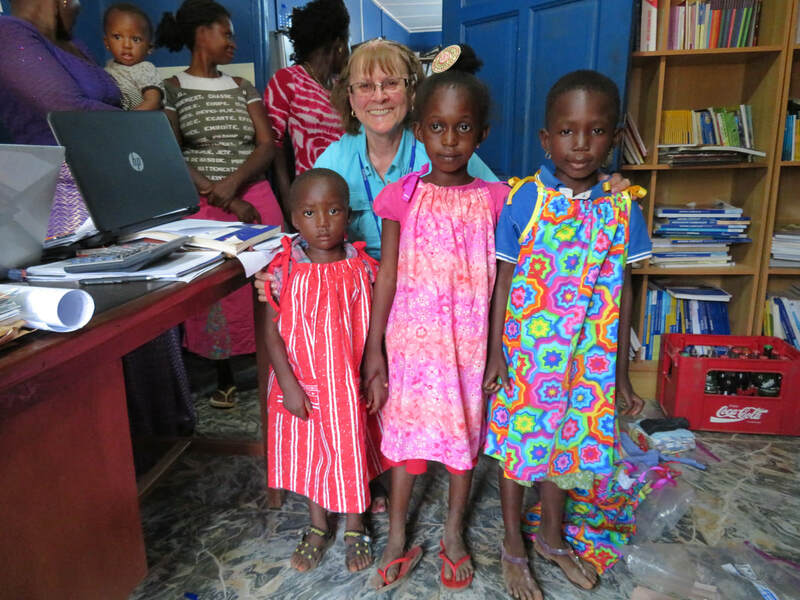 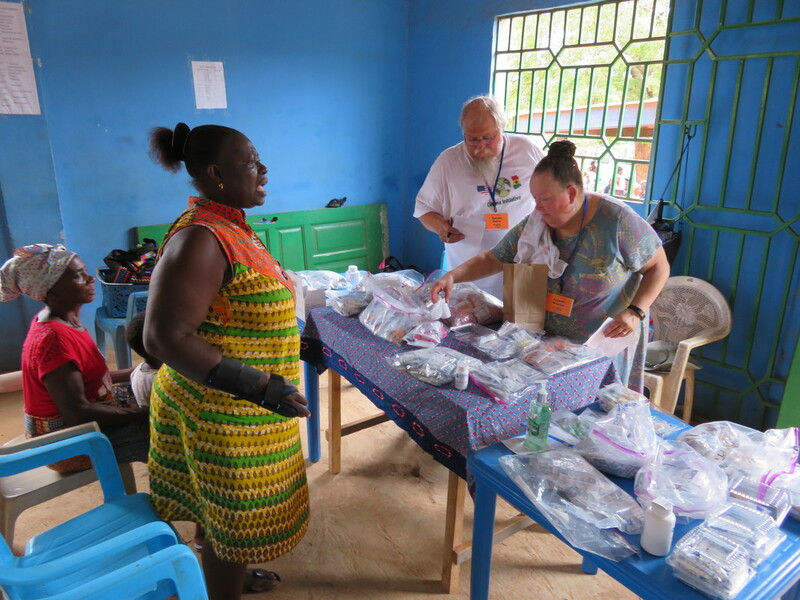 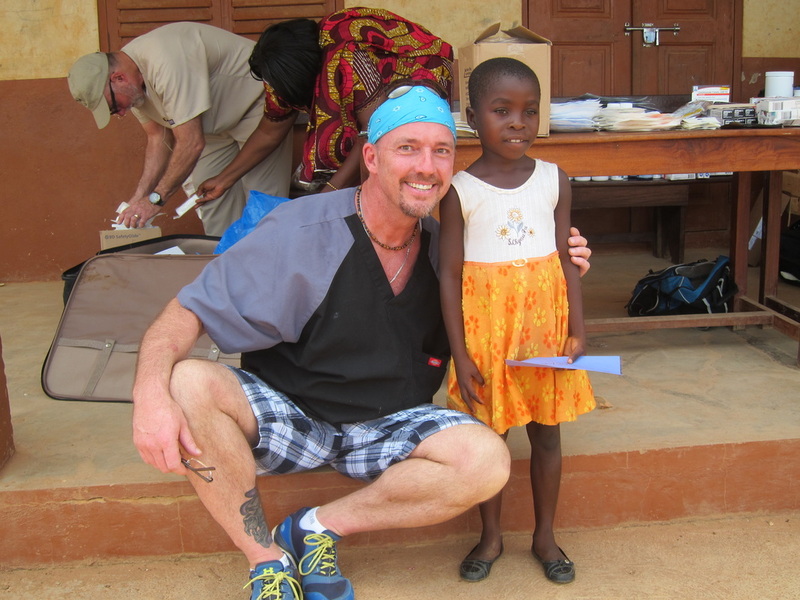 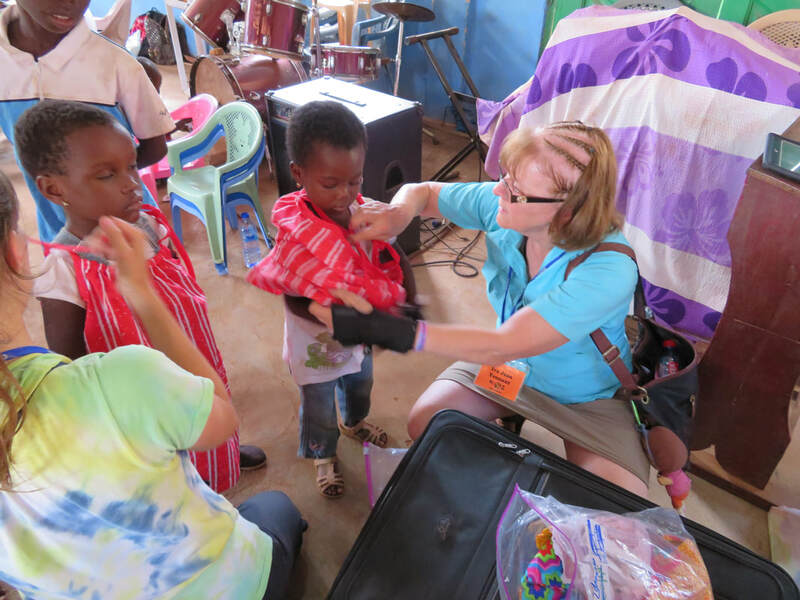 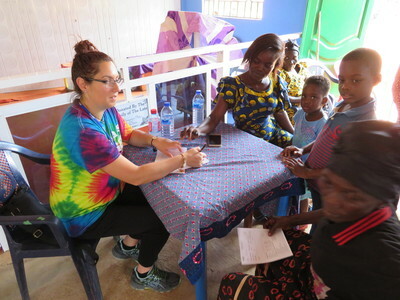 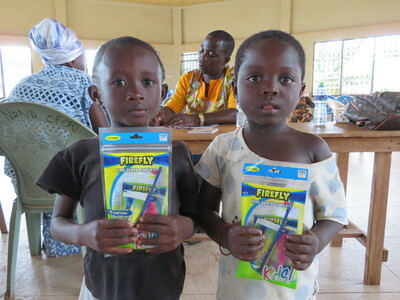 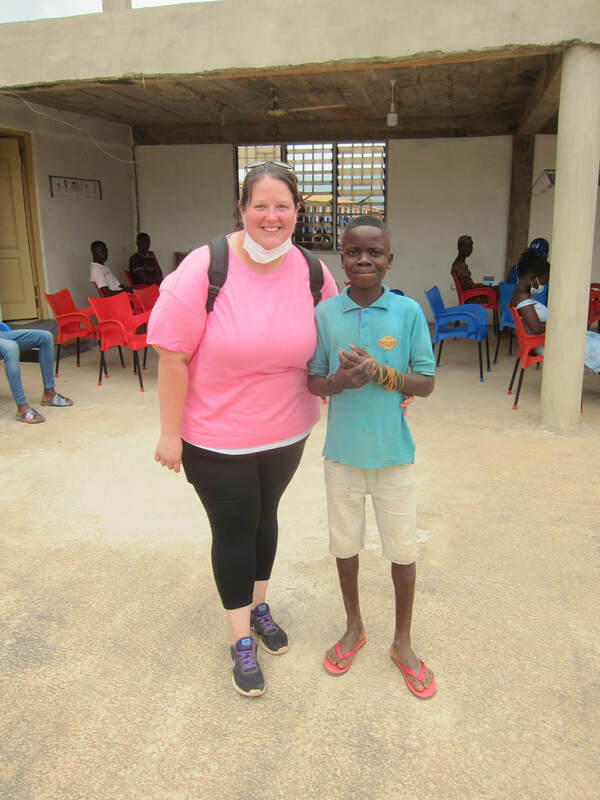 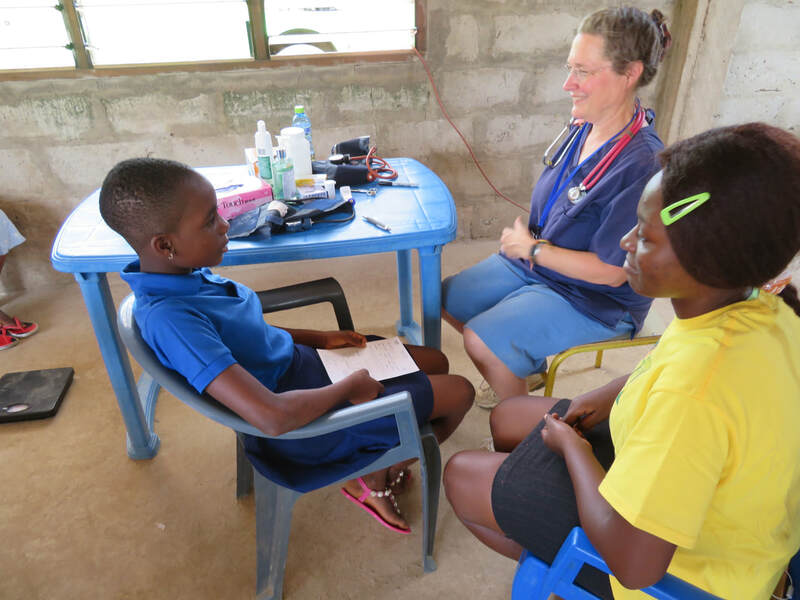 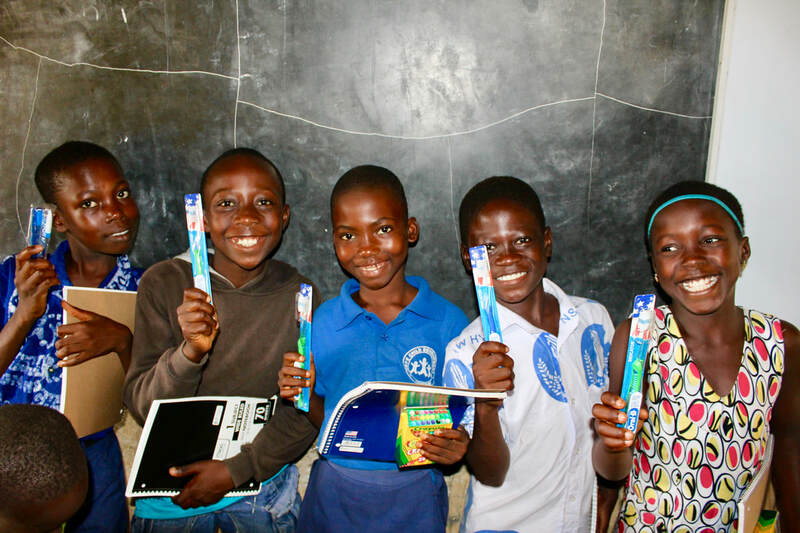 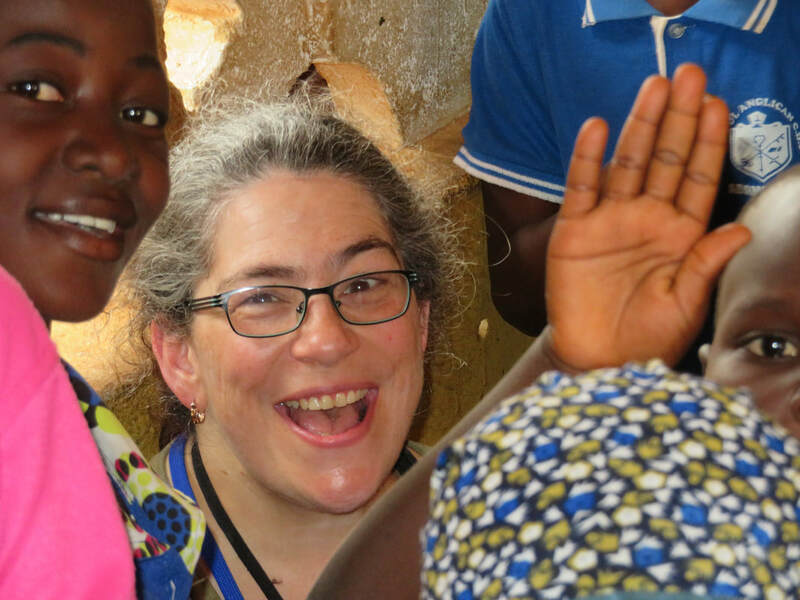 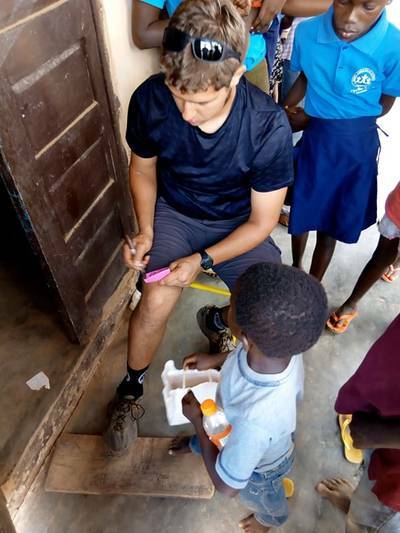 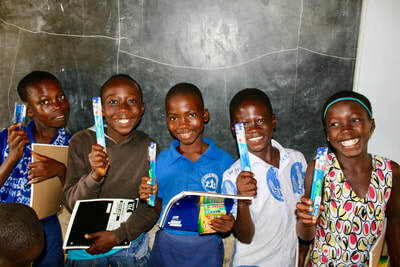 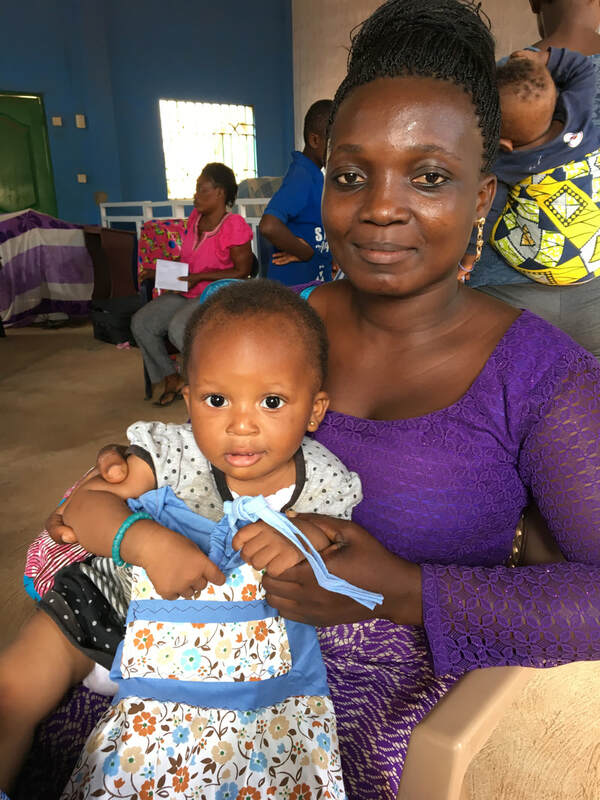 Ghana Initiative has teamed up with Rebecca Parker Family Dentistry in Lititz, PA for the last 3 years to provide children and adults with free toothbrushes and tooth care kits. To date we have distributed more than 3000 tooth care products to people in communities throughout the Eastern Region of Ghana. 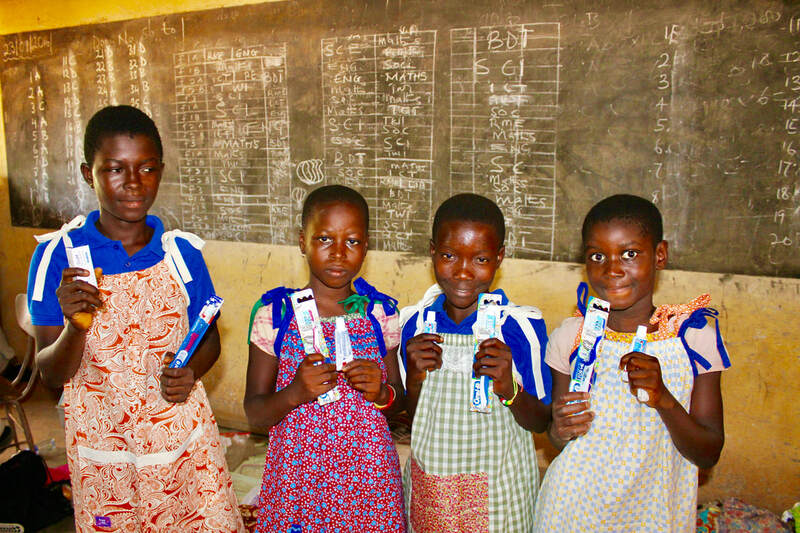 When the children receive the brushes, they smile from ear to ear because they know that they will be able to keep their teeth clean and healthy. 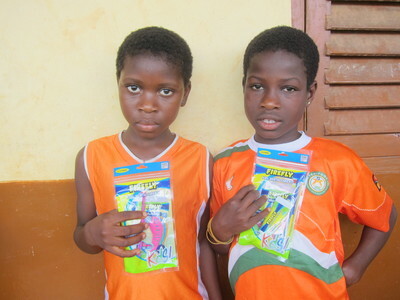 We look forward to playing a part in brightening the smiles of the children in Ghana for years to come. Malaria has no mercy. 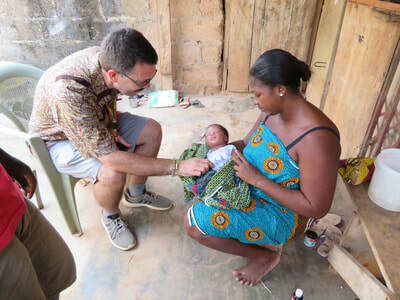 It is a killer in many parts of the world, but especially rampant in the tropical country of Ghana, Western Africa where heat, humidity and standing water provide perfect breeding conditions for malaria carrying mosquitoes. 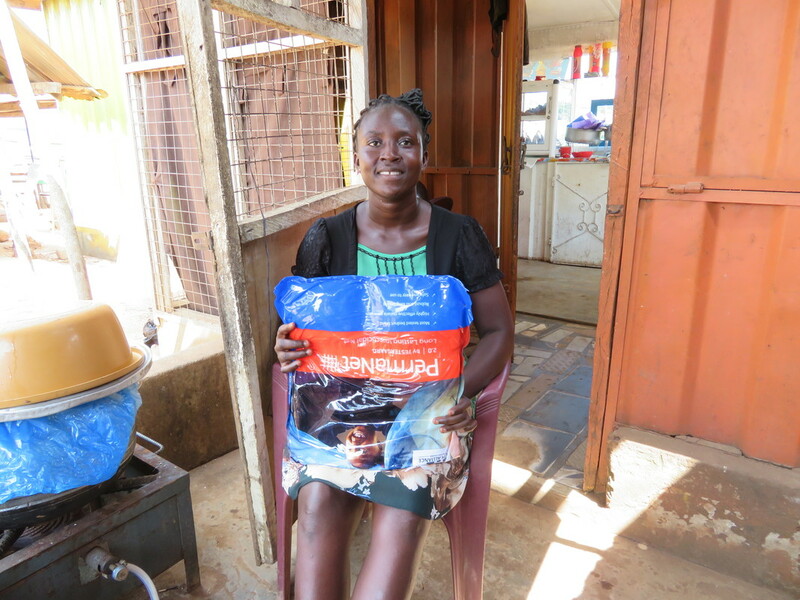 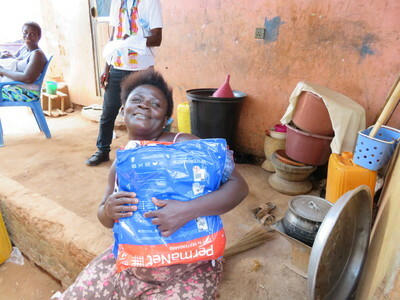 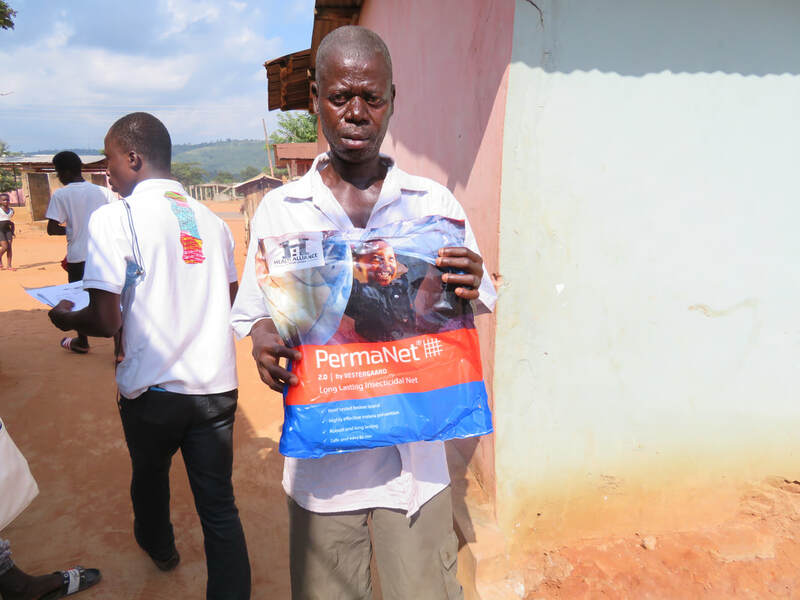 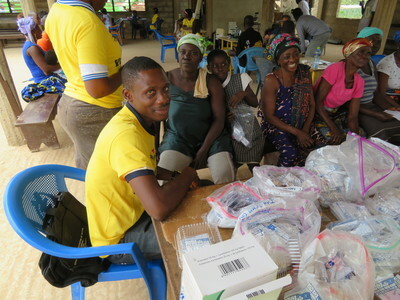 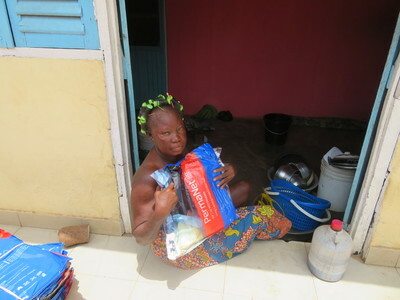 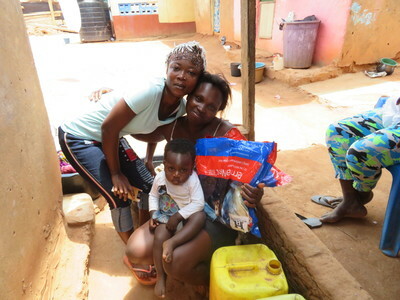 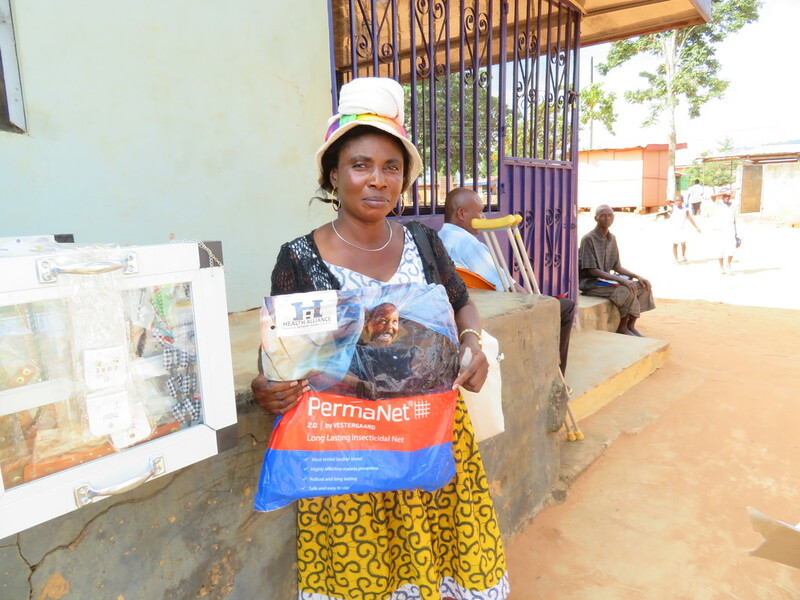 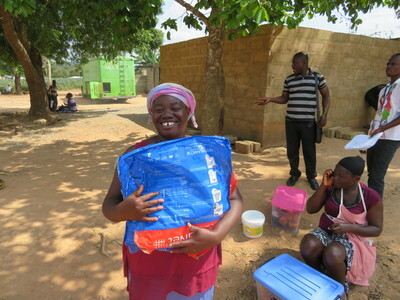 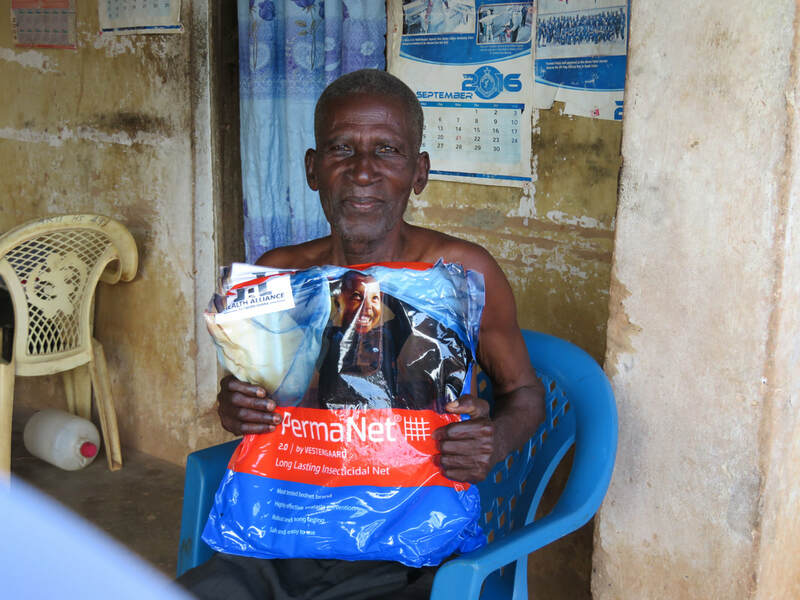 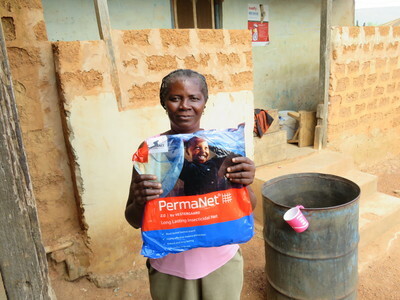 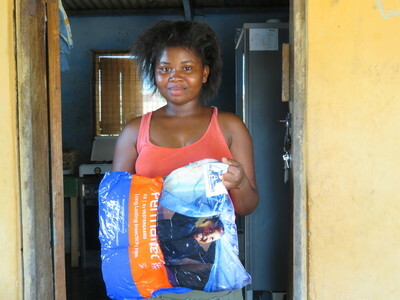 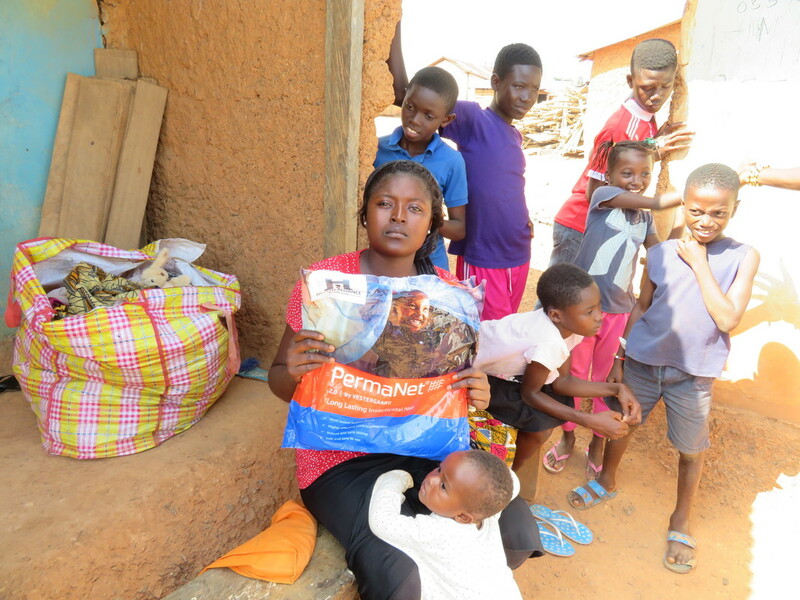 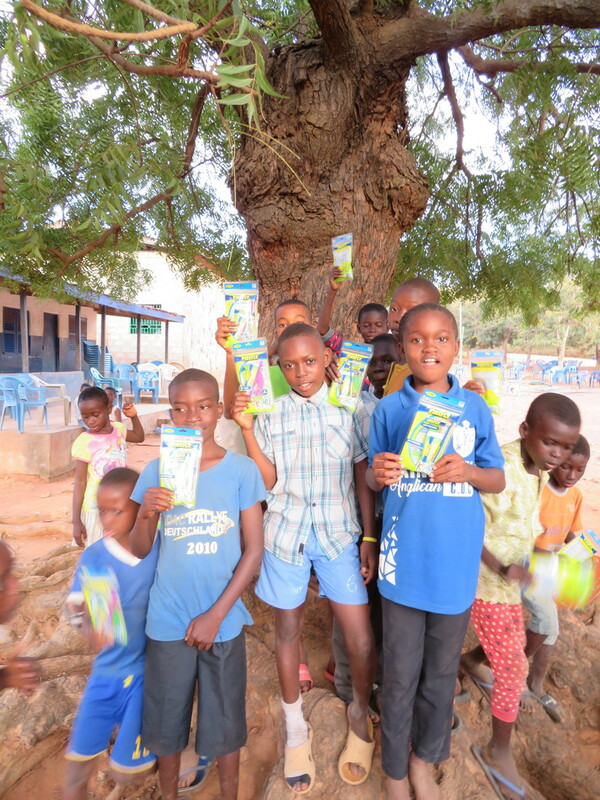 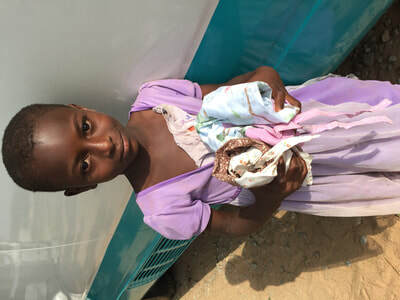 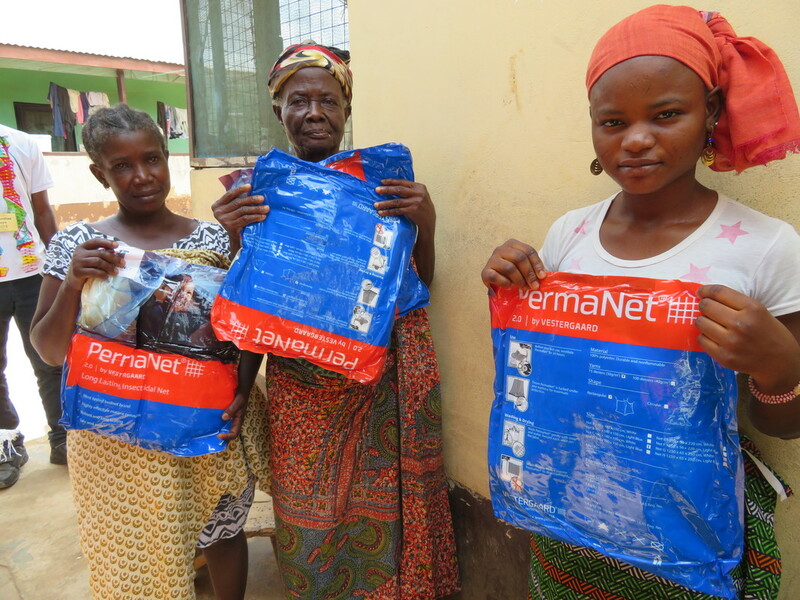 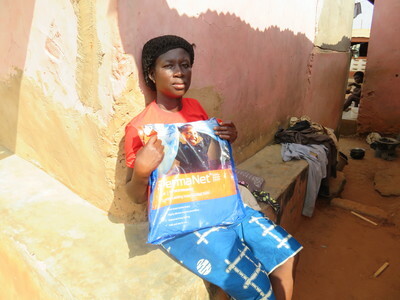 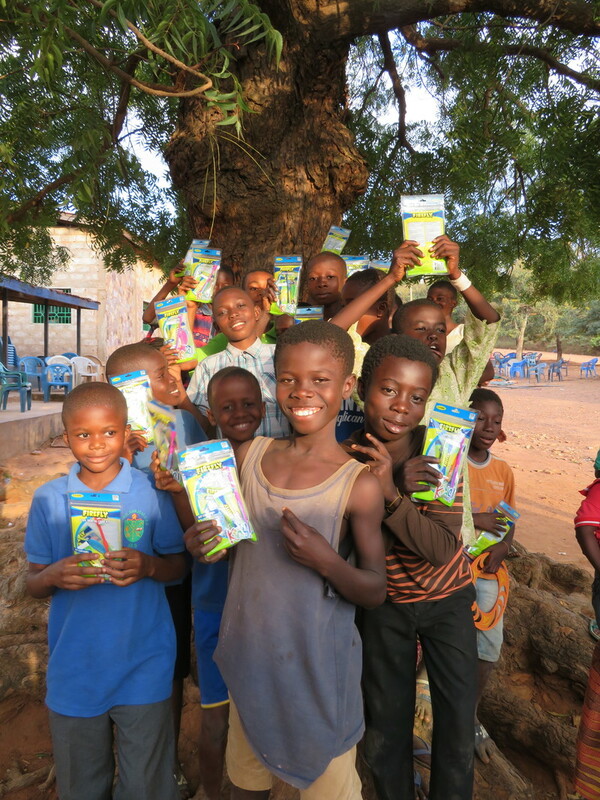 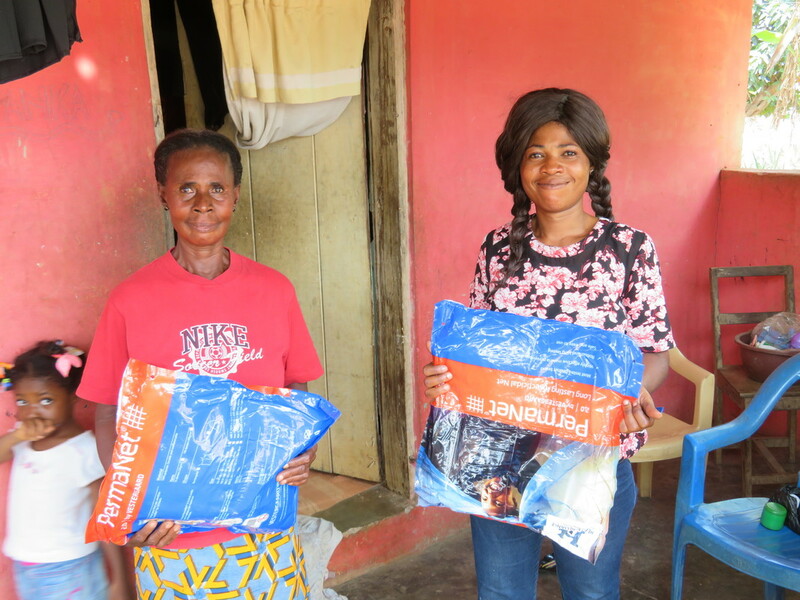 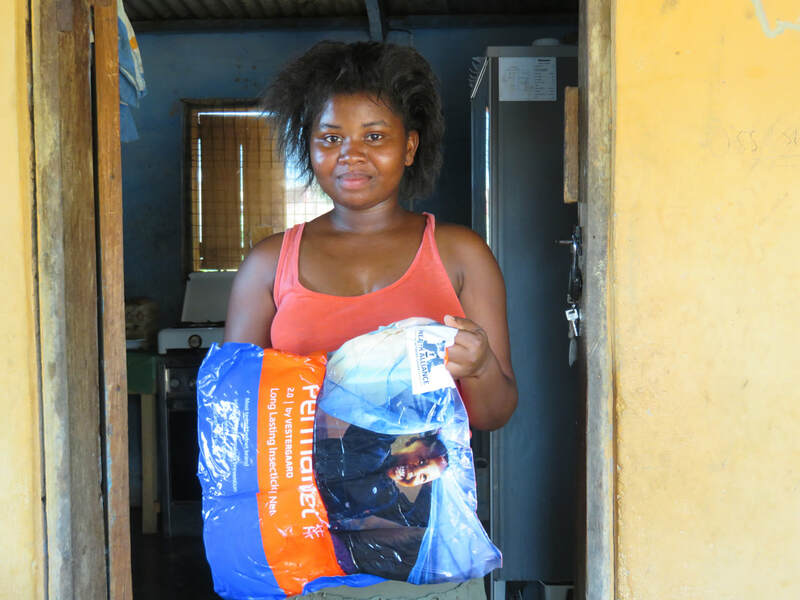 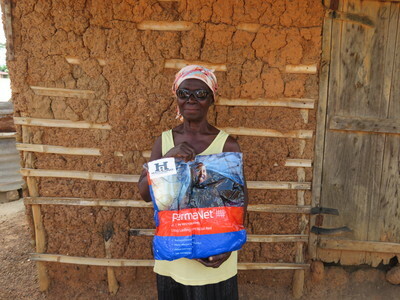 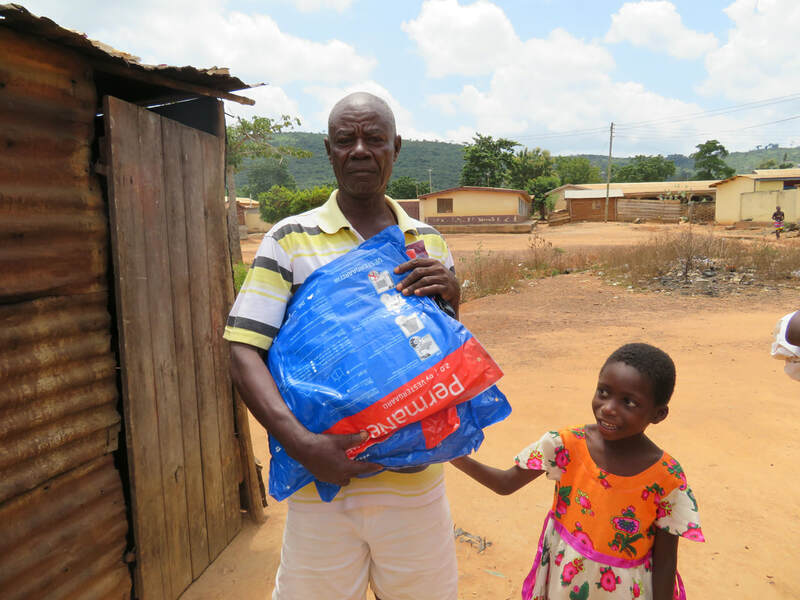 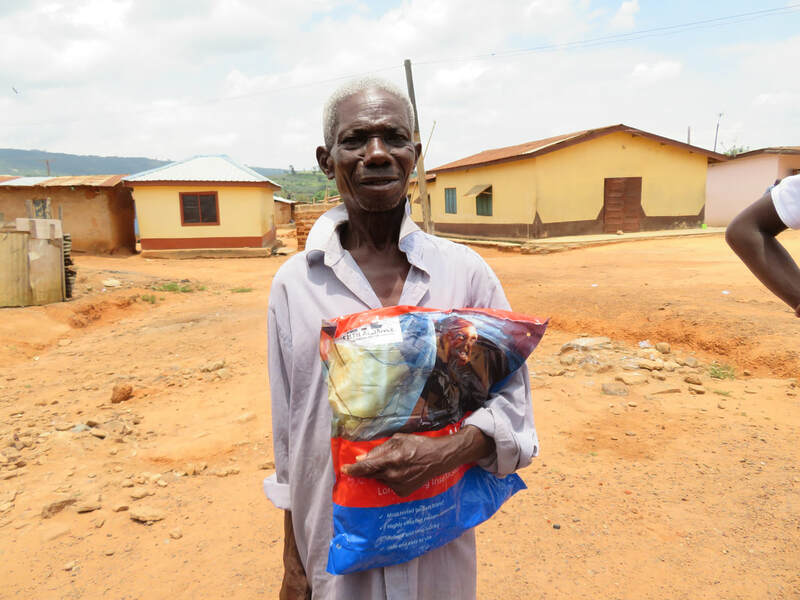 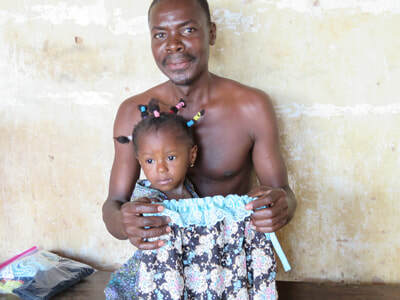 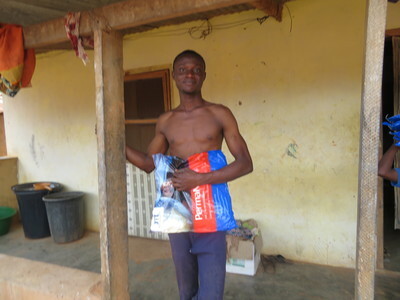 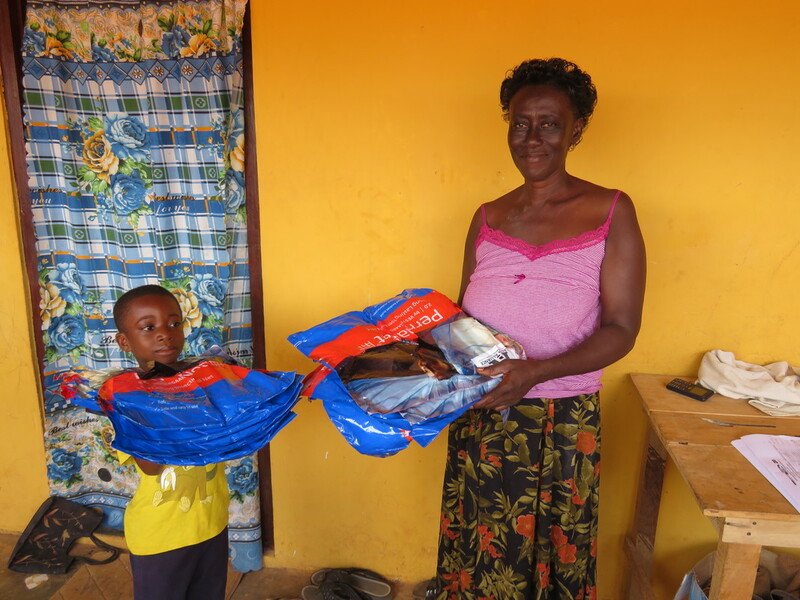 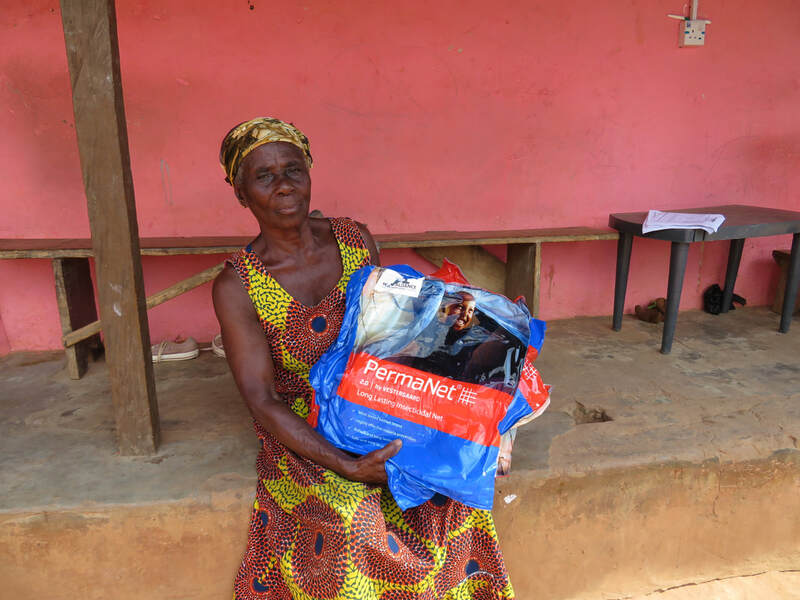 Ghana Initiative MMM has made a point of pushing back malaria and it's impact on rural communities by distributing mosquito repellent bed nets to those living in mosquito prone areas. 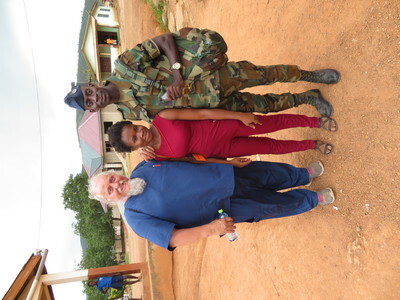 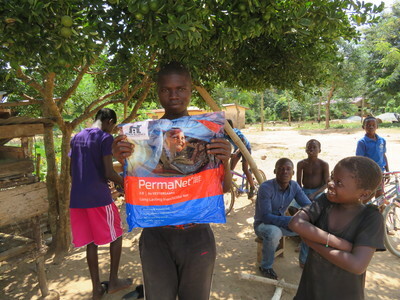 We have been doing this for 3 years and seen a dramatic decrease in the incidence of malaria in targeted communities. 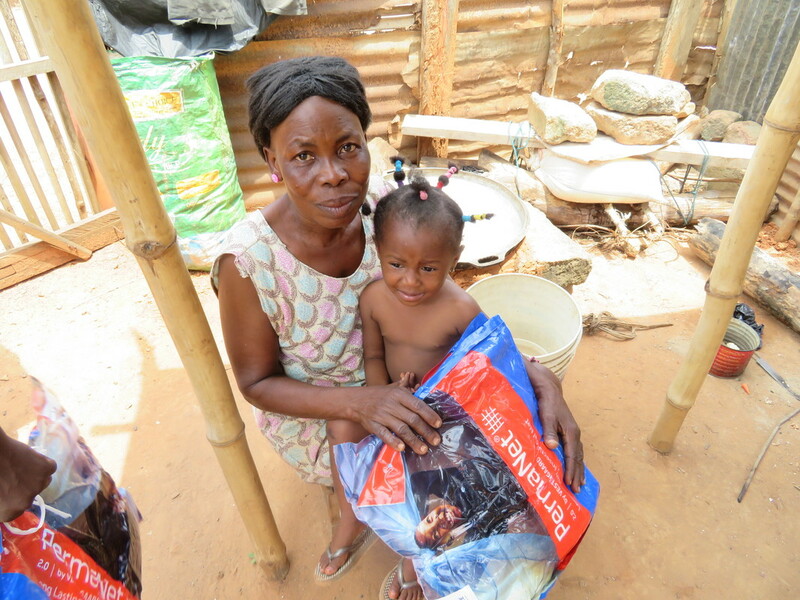 Our goal is to provide 1000 bed nets per year to those with the greatest need. 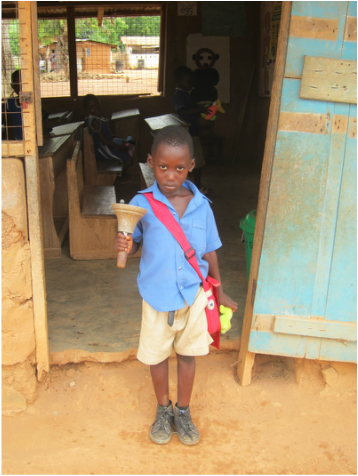 One would think that education is a right for everyone. 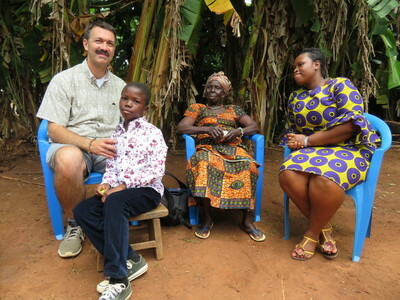 This is true in the USA but not quite the same in Ghana. 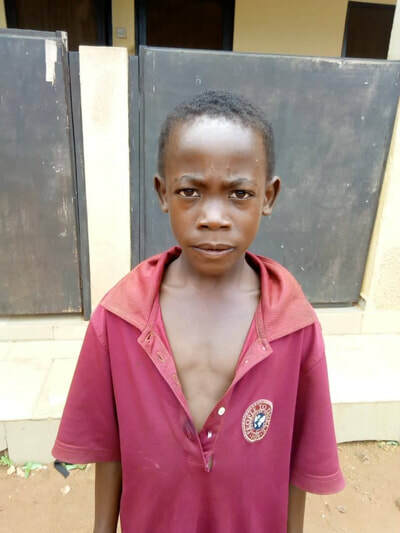 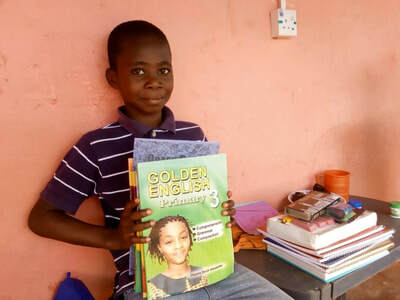 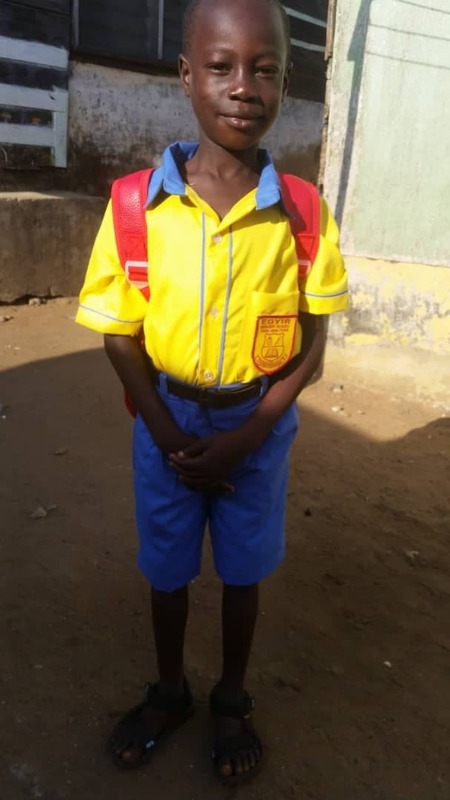 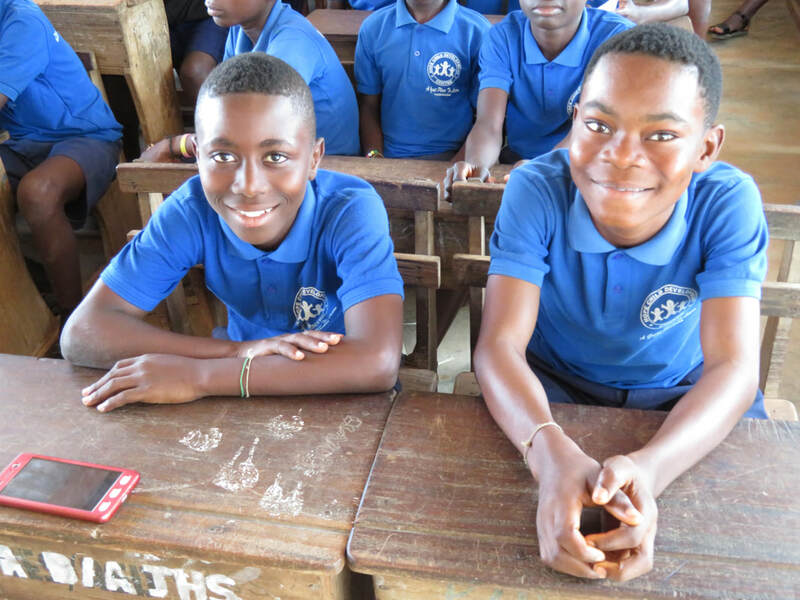 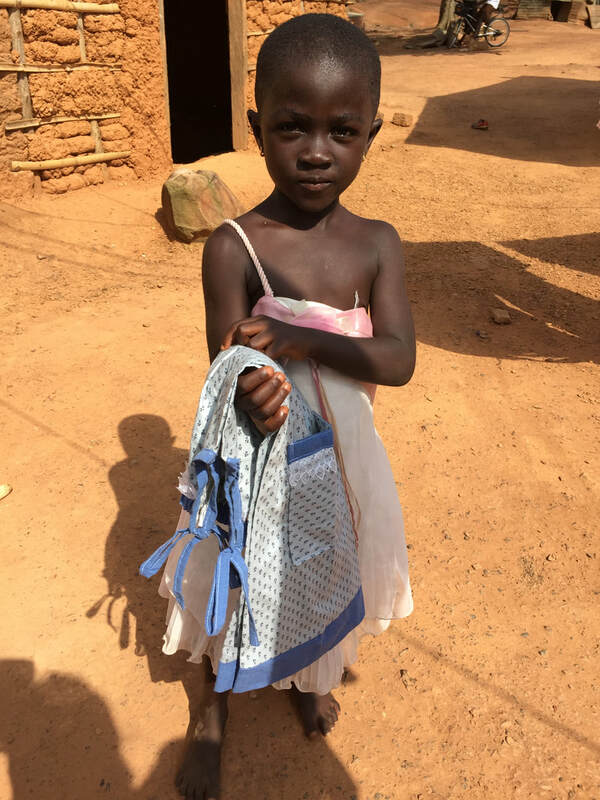 Many children are unable to attend school because their parents don't have the funds necessary to buy school uniforms, pay school fees and provide school supplies for their children. 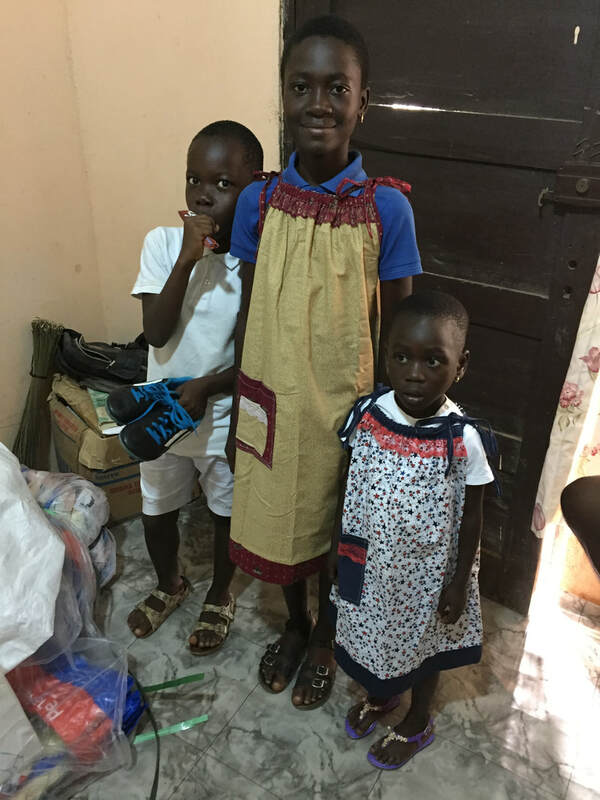 things are especially grim for girls who often are kept at home to help tend to younger siblings, clean the house or work in the kitchen. 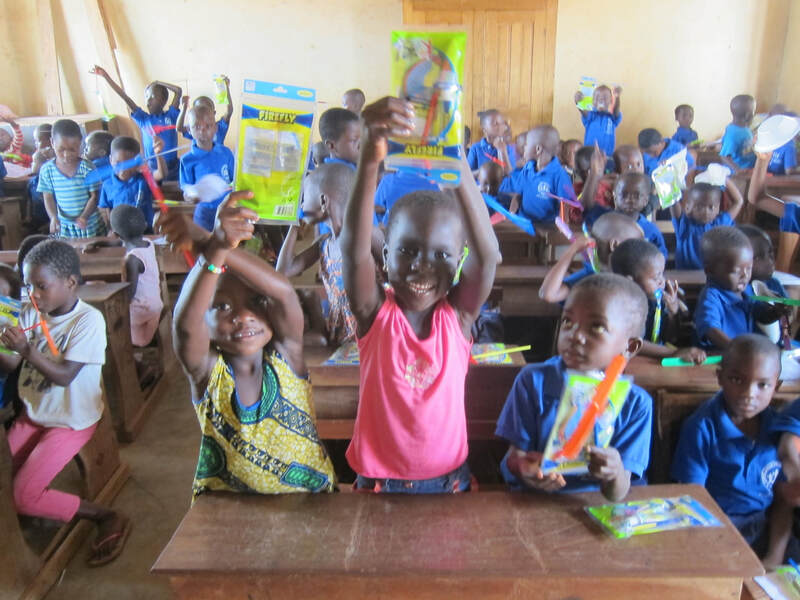 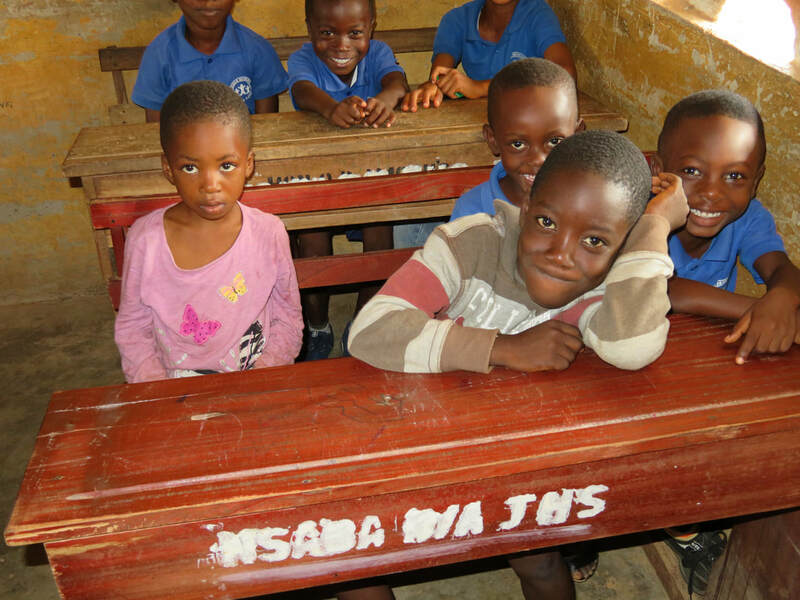 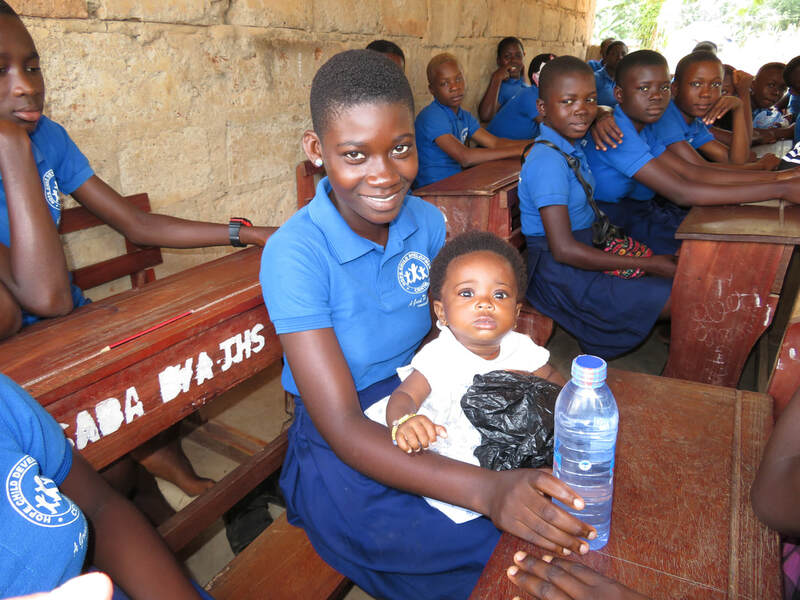 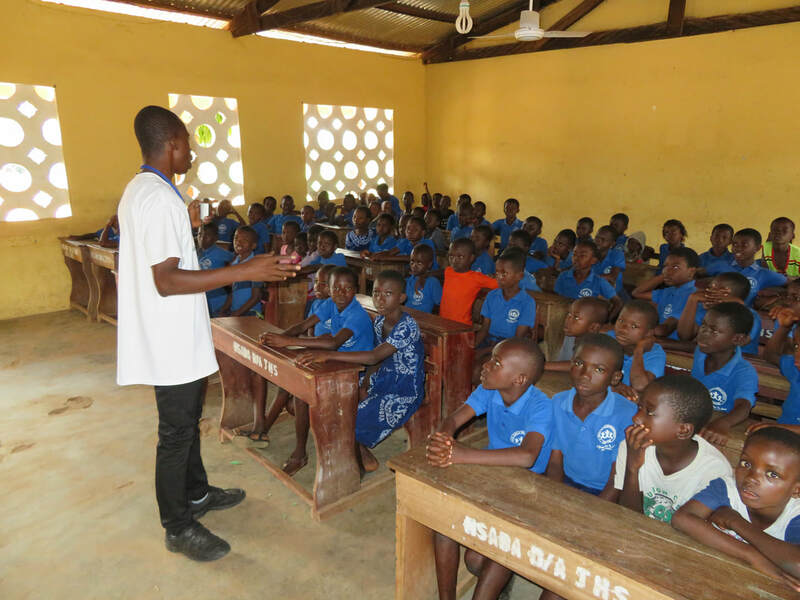 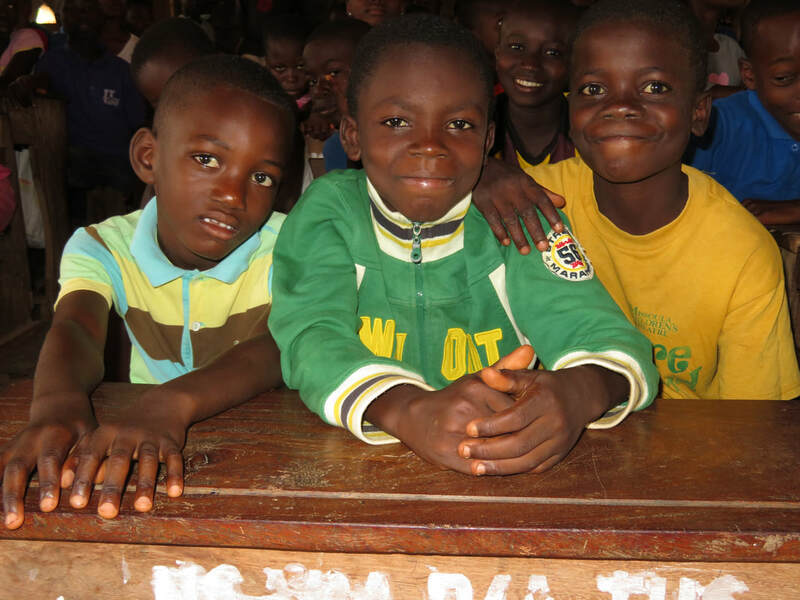 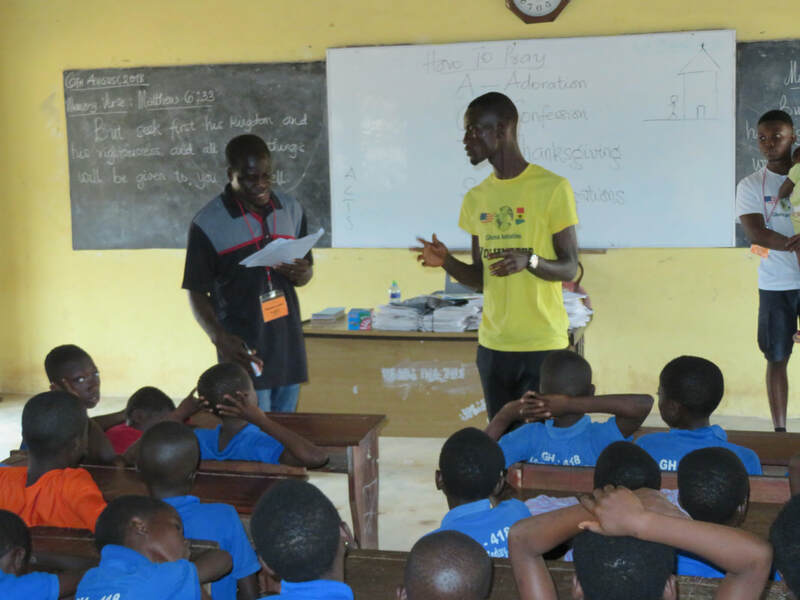 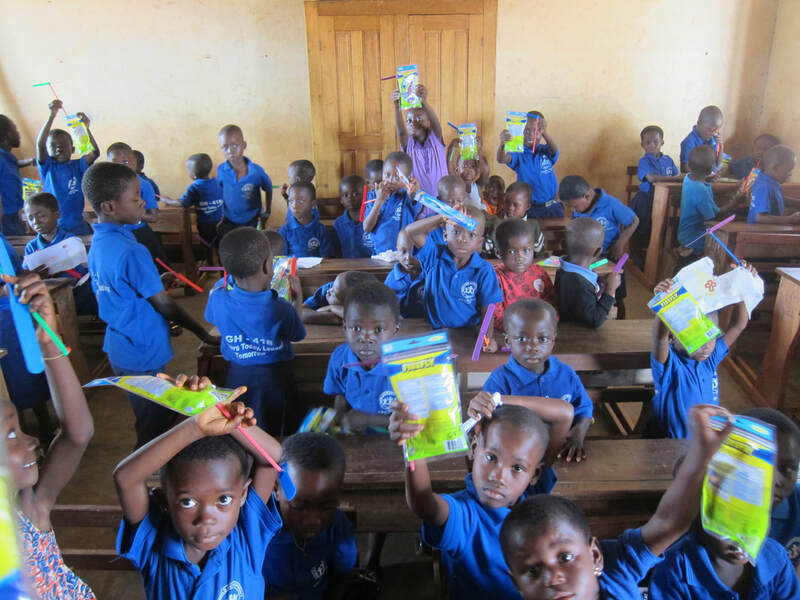 Ghana Initiative developed a ministry in 2016 to get children in need back to school. 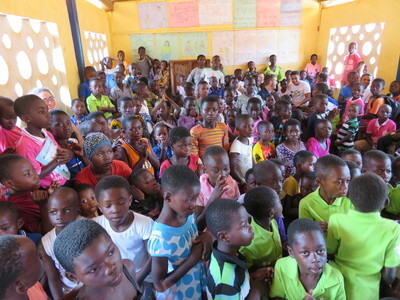 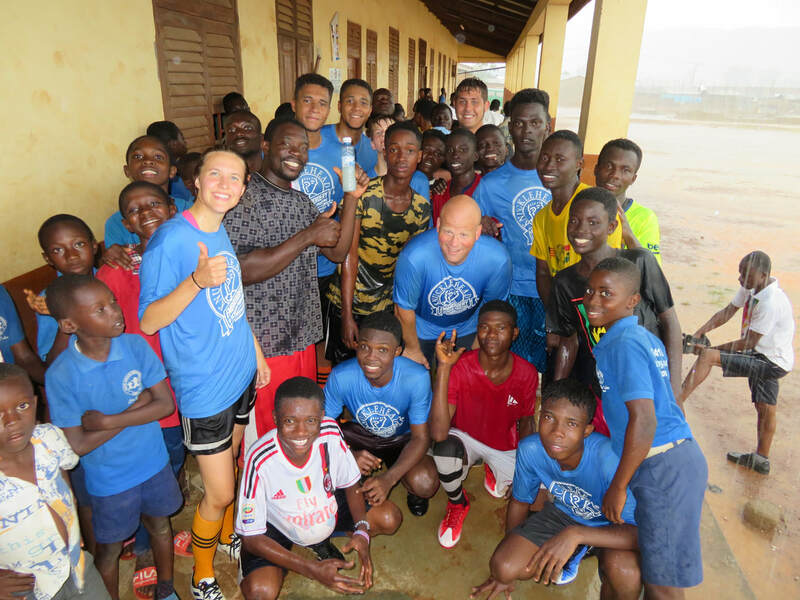 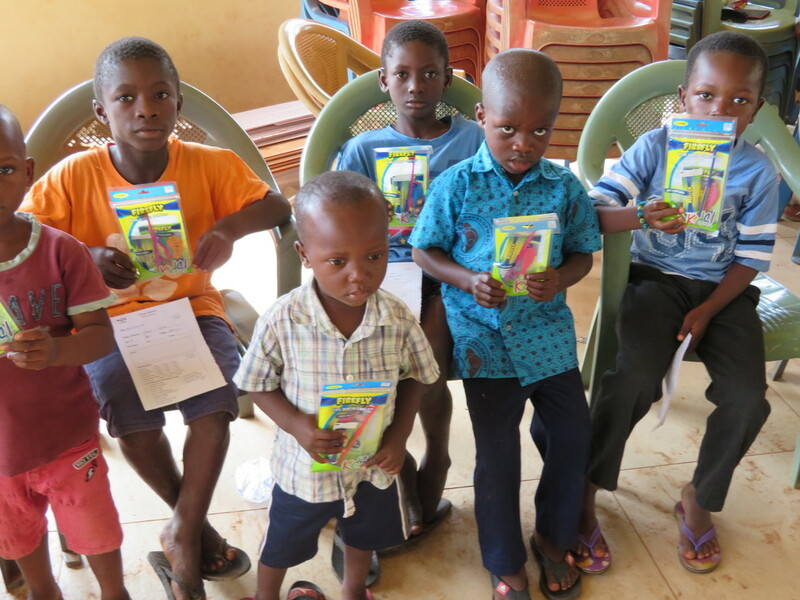 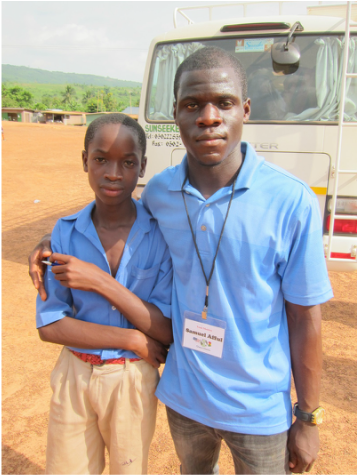 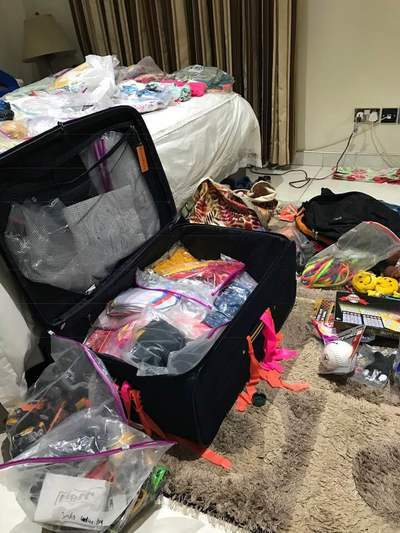 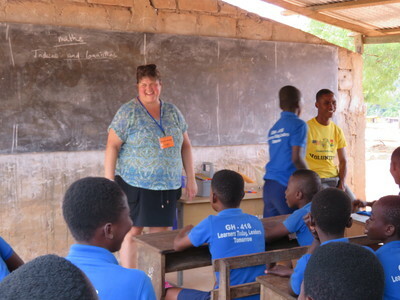 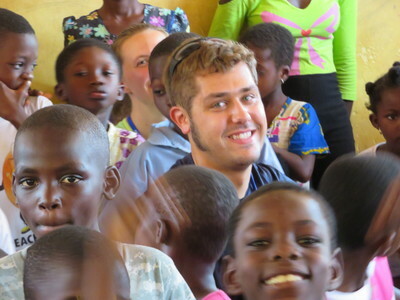 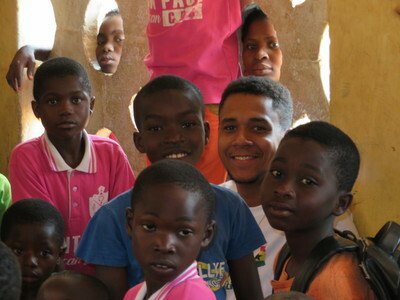 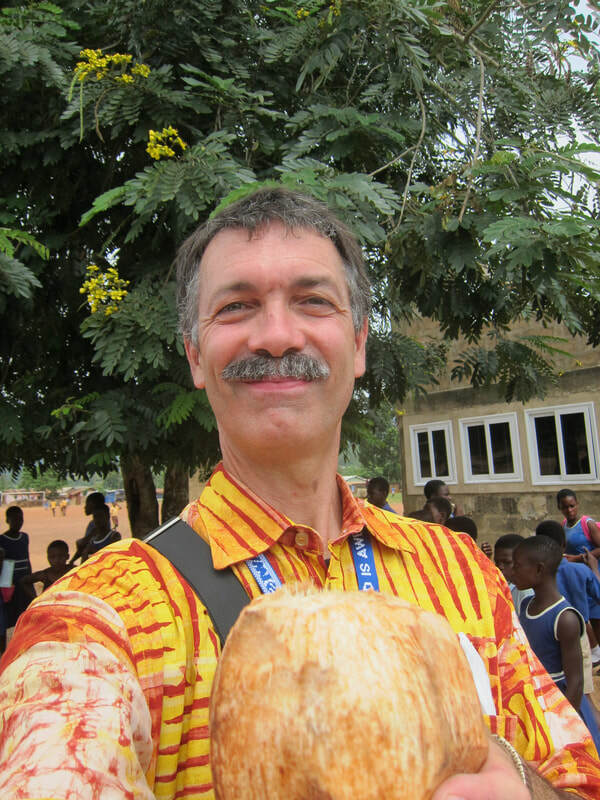 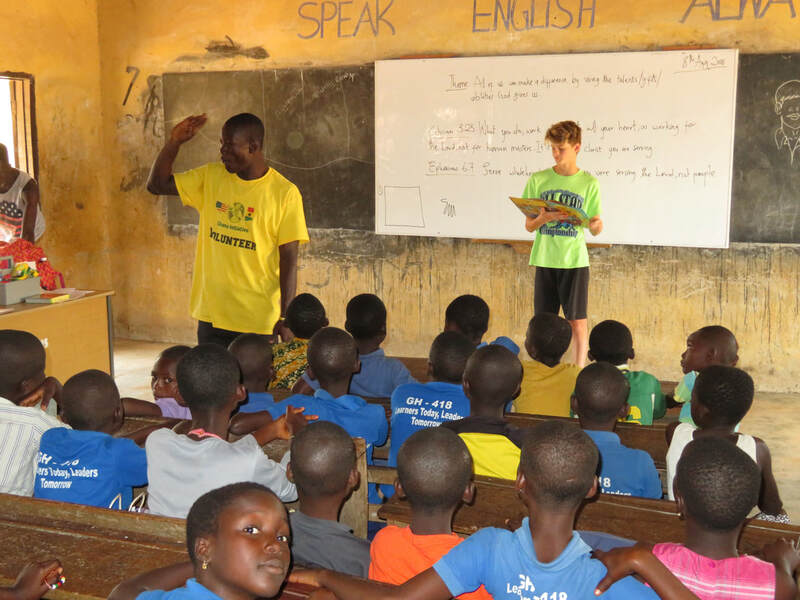 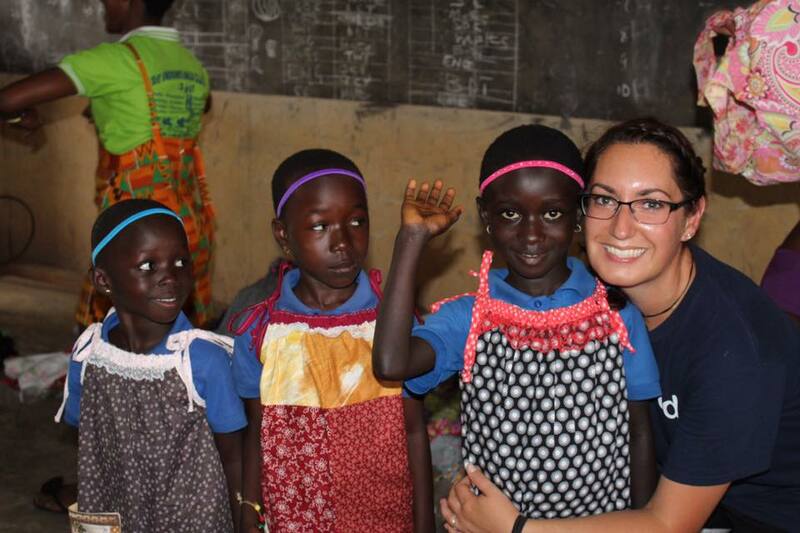 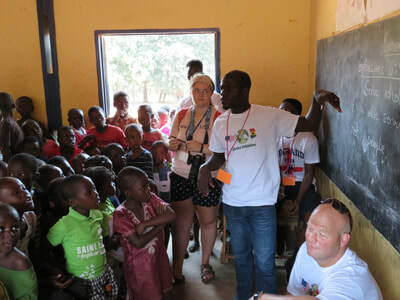 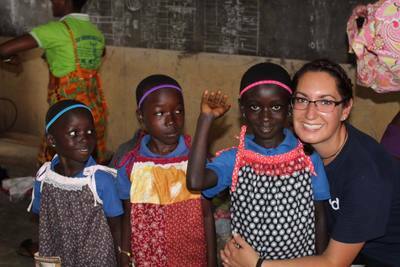 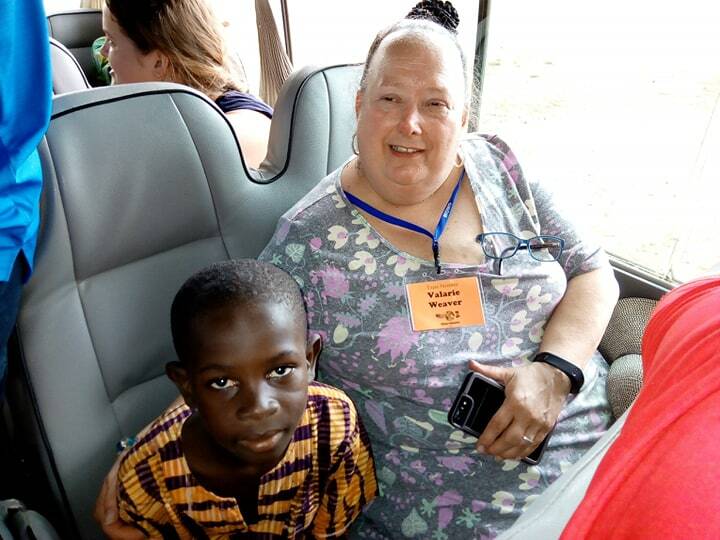 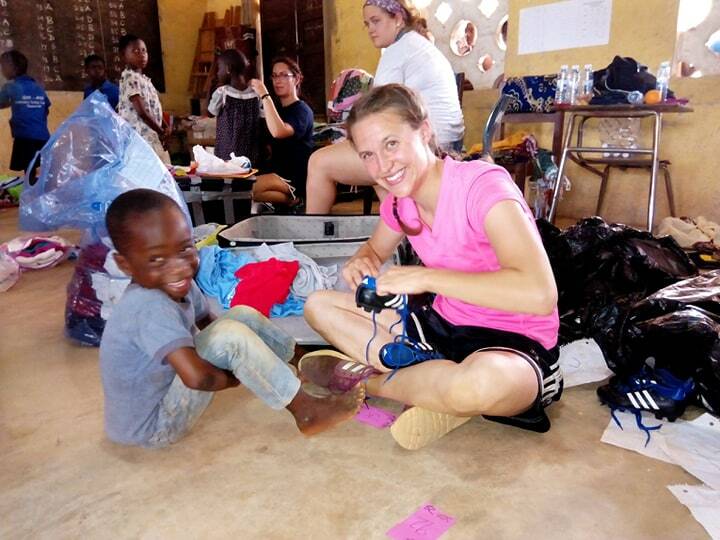 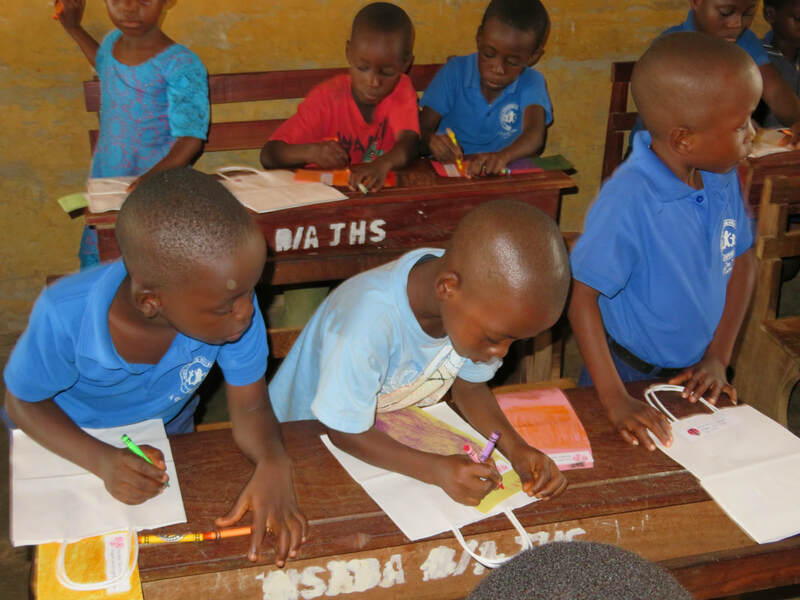 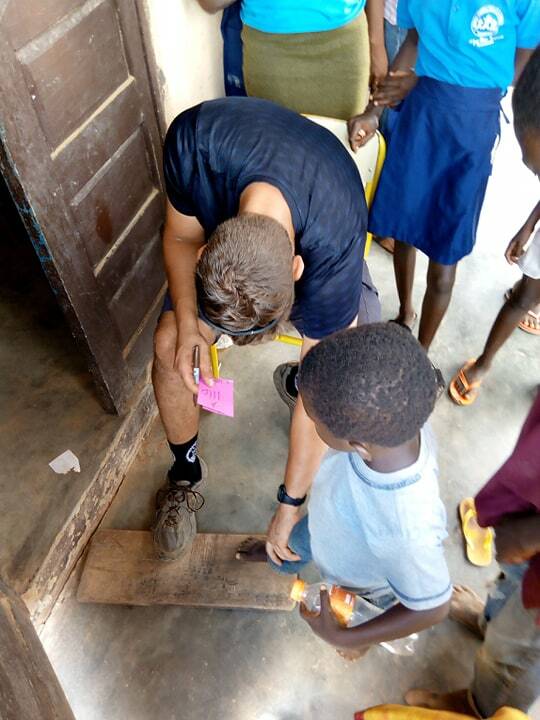 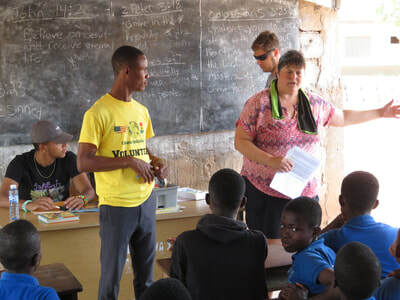 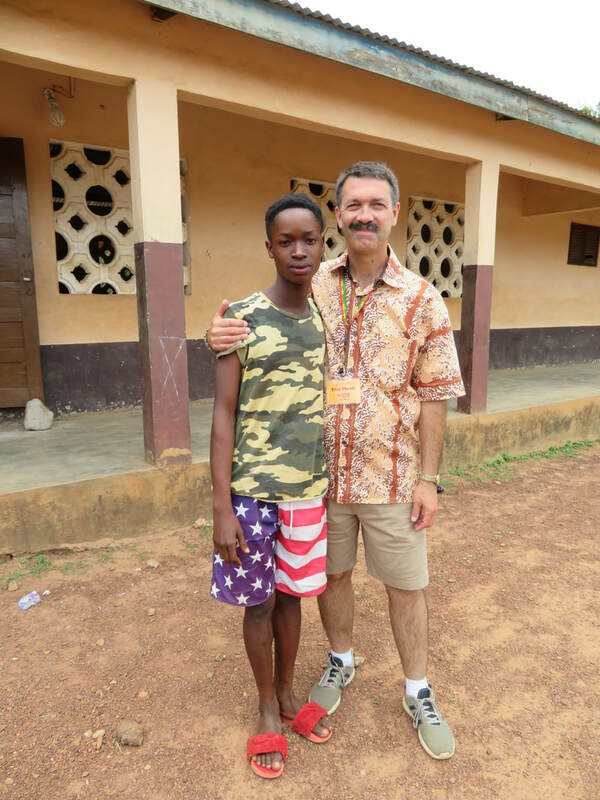 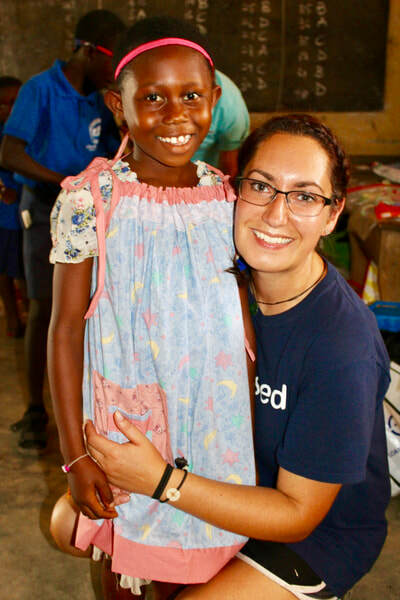 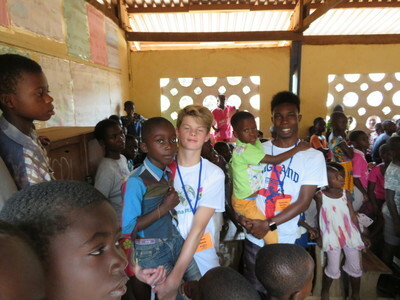 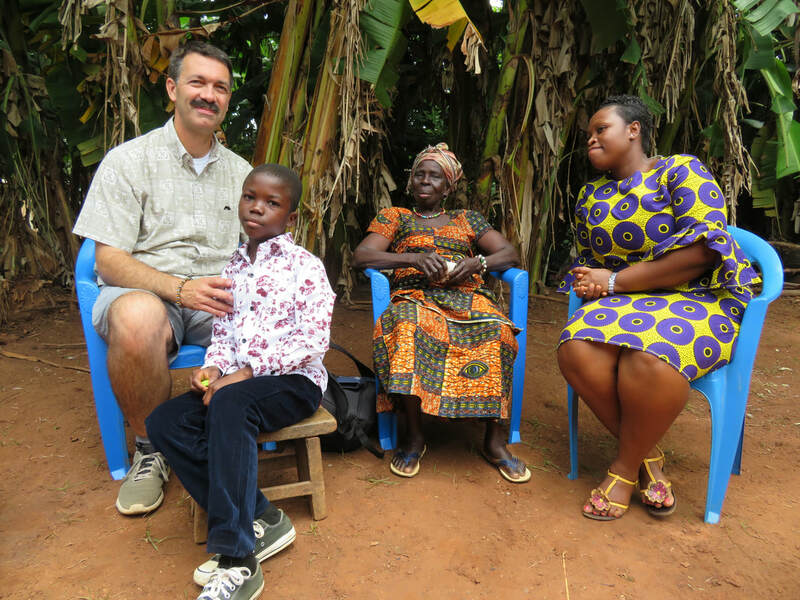 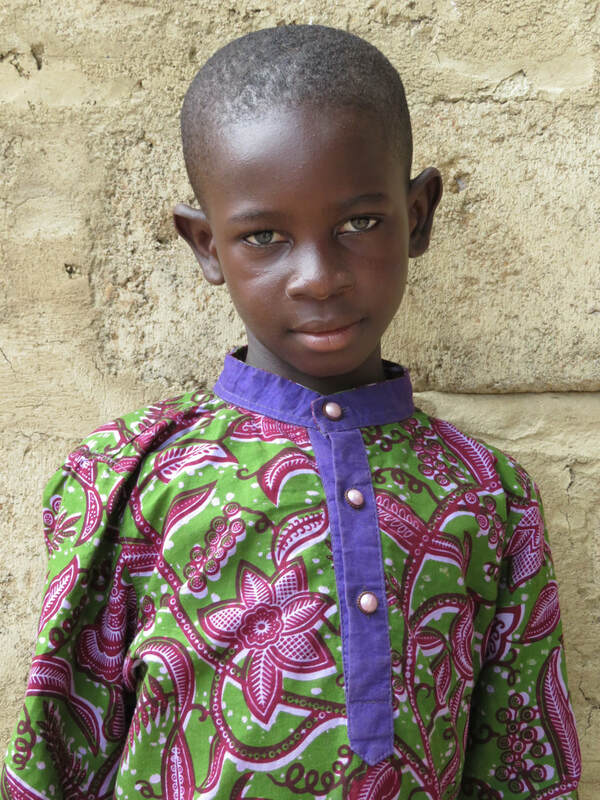 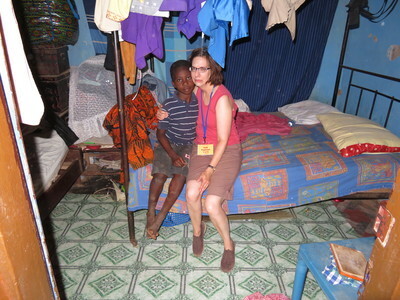 Our program pairs willing sponsors in the USA with needy children across Ghana. 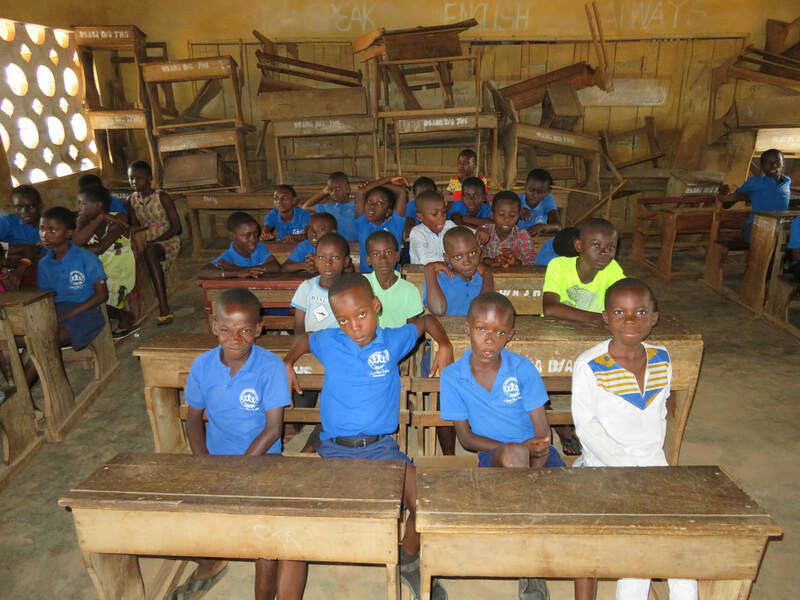 The sponsors provide financial support for the children through Ghana Initiative MMM by paying a nominal amount on a monthly basis. 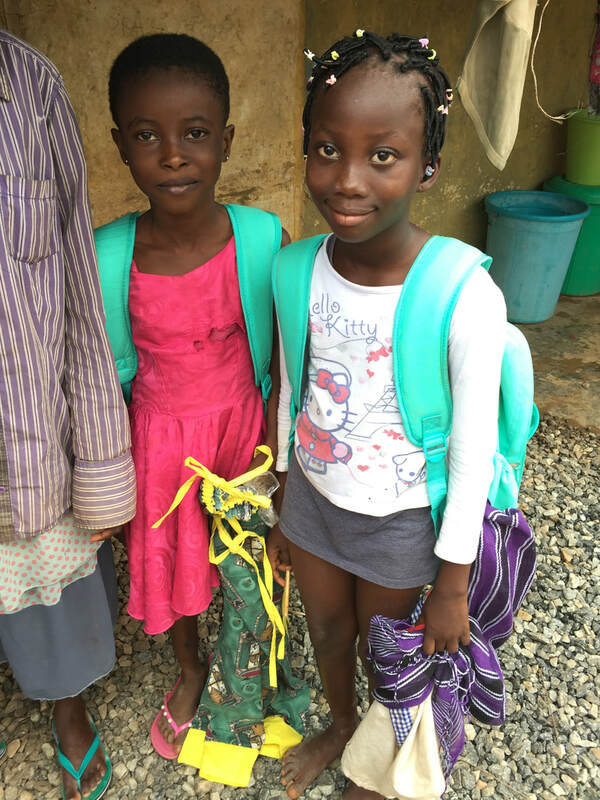 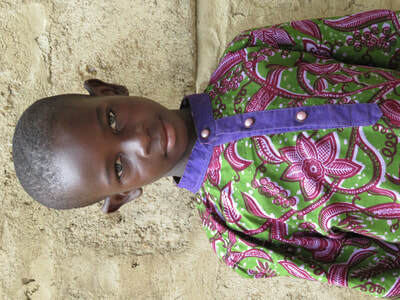 This support pays for school fees, uniforms, books and school supplies and feeding fees. As a result the children are able to attend school consistently and grow into productive citizens of Ghanaian society. 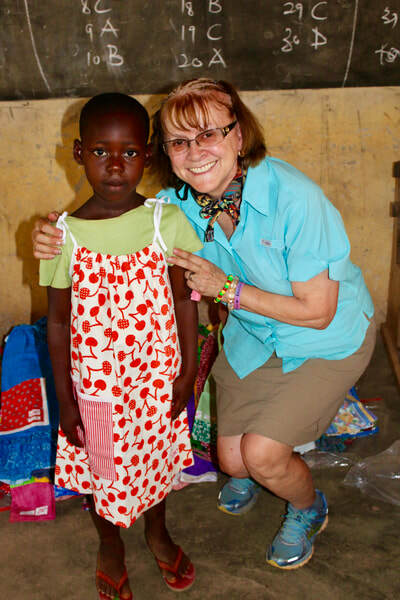 Each year this program grows as more children are sponsored by loving, caring sponsors in the USA. Every now and then, the leadership of Ghana Initiative MMM is approached by members of the communities where we serve, asking for us to assist them with special surgical needs. 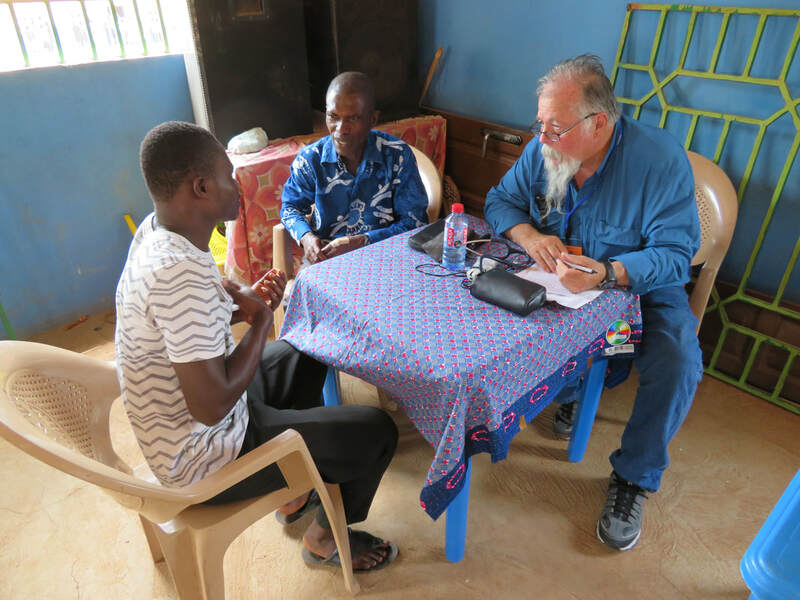 After careful consideration and prayer, our board of directors decides whether we are equipped to assist medically or financially. 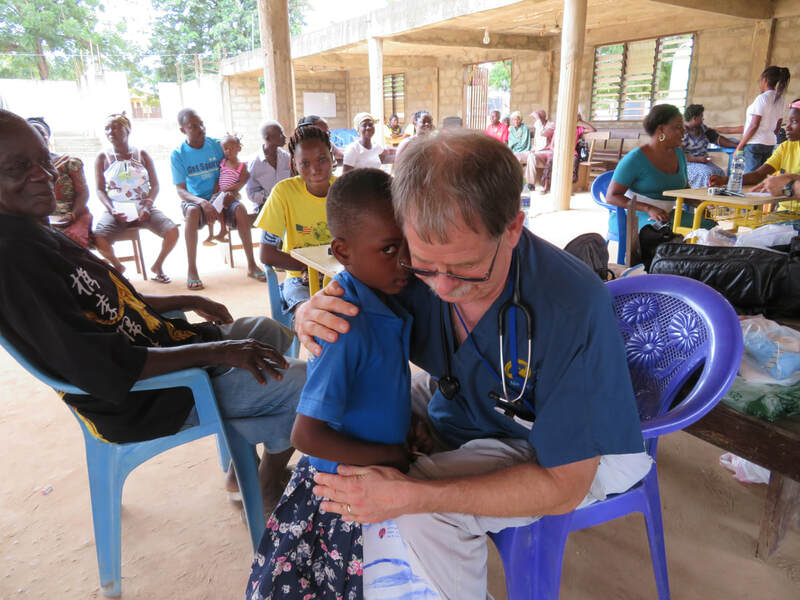 Once we set our minds to it we ask our supporters to pray for those in need of healing and our financial supporters to sew into the surgical need at hand. 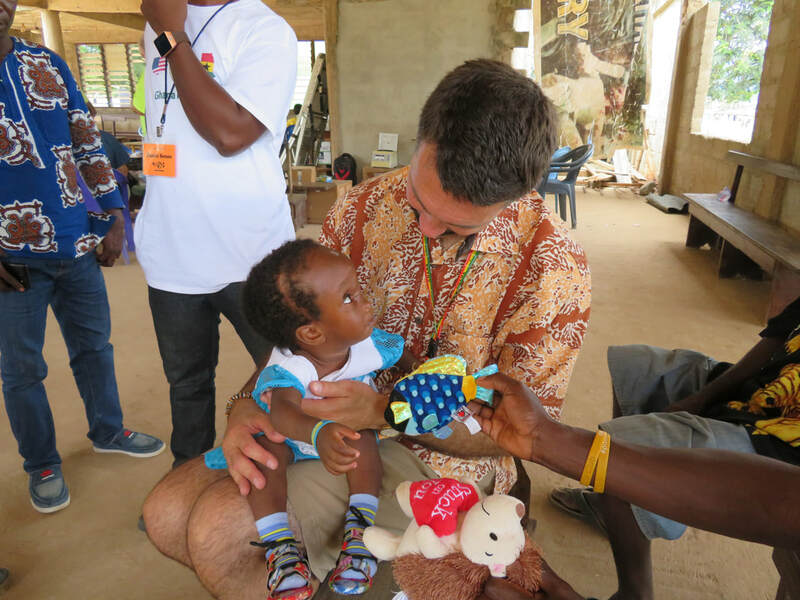 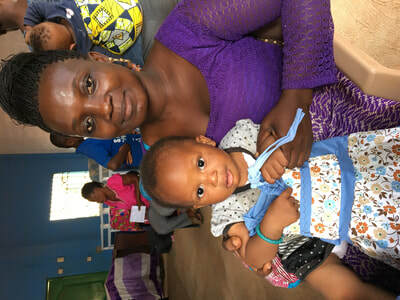 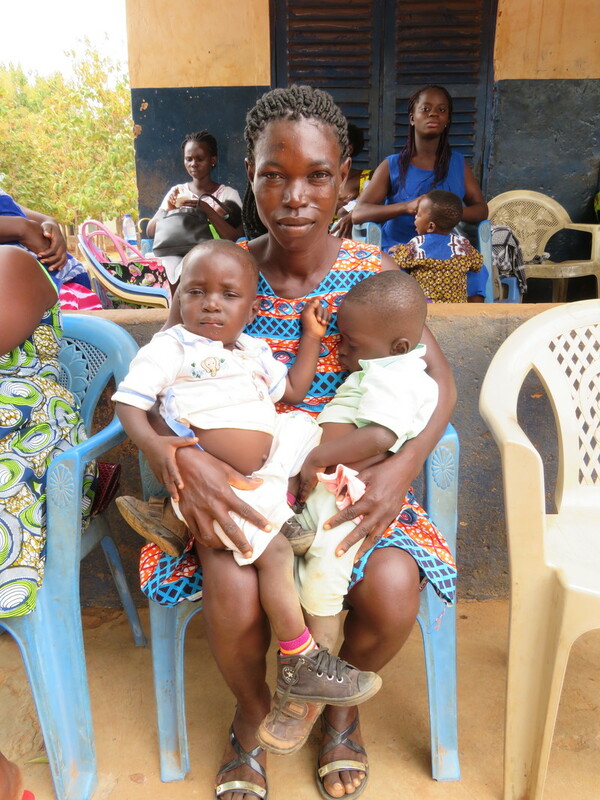 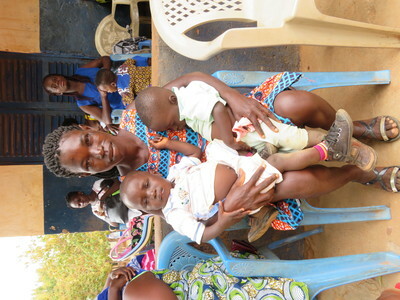 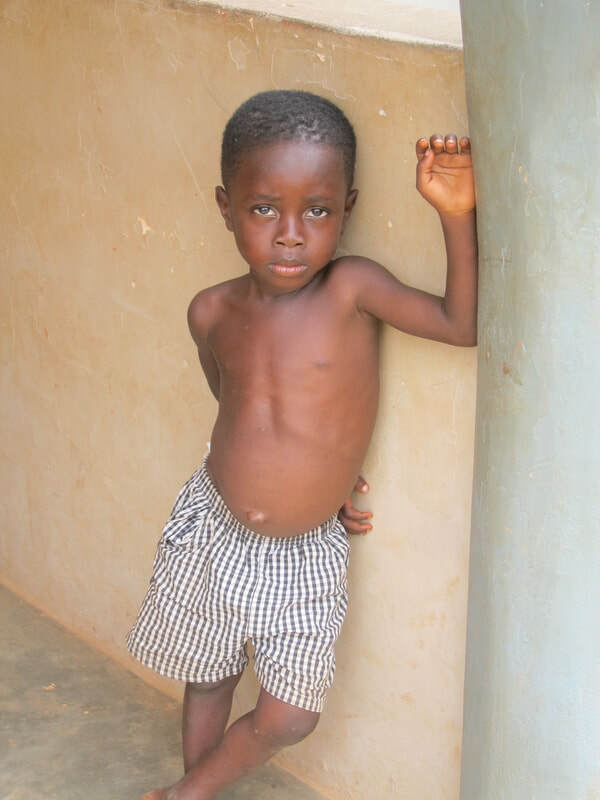 To date we have been blessed to take part in four special surgeries for four different children in Ghana. We look forward to where God leads us next. 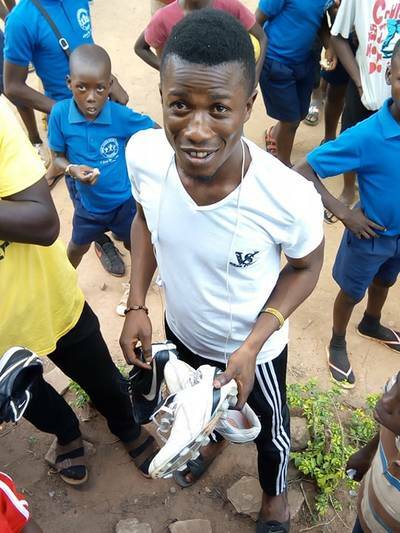 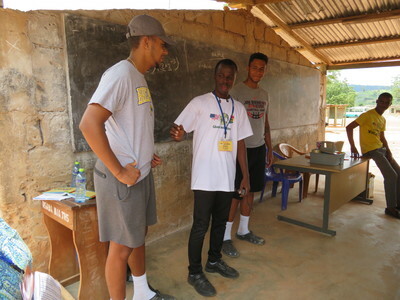 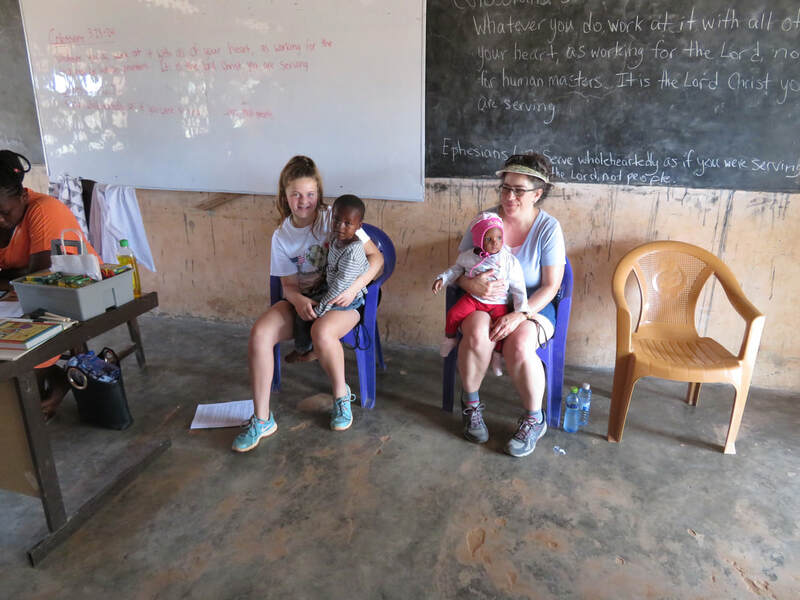 In this video, Ghana Initiative team member, Samuel Afful opens our day in Pokrom Nsaaba with a time of devotion, prayer and song! Samuel teaches the children a memory verse from the Bible while the children enjoy a much deserved frozen snack. 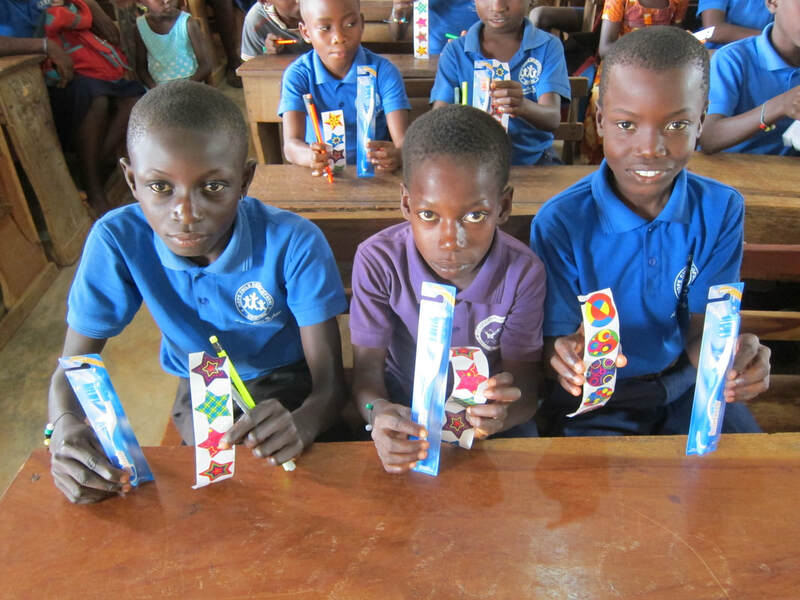 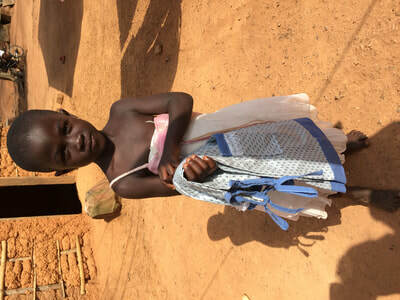 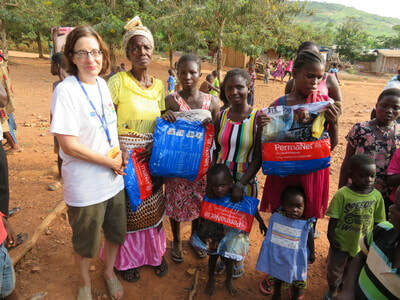 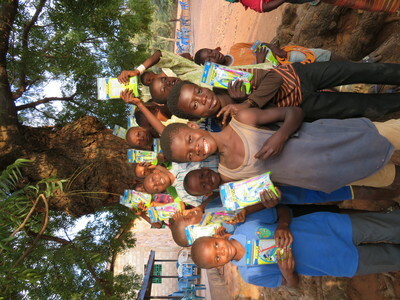 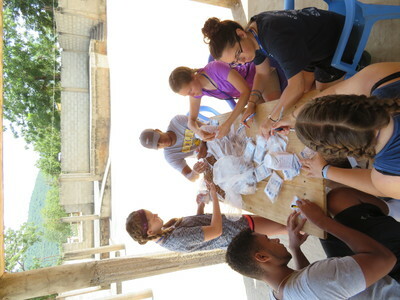 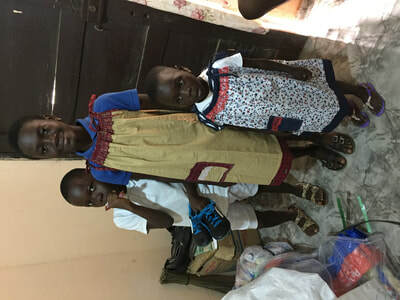 ​The children each have a bag that they will use for the week at Bible School. Prayer team prays with a member of the Pokrom Nsaba community for healing!